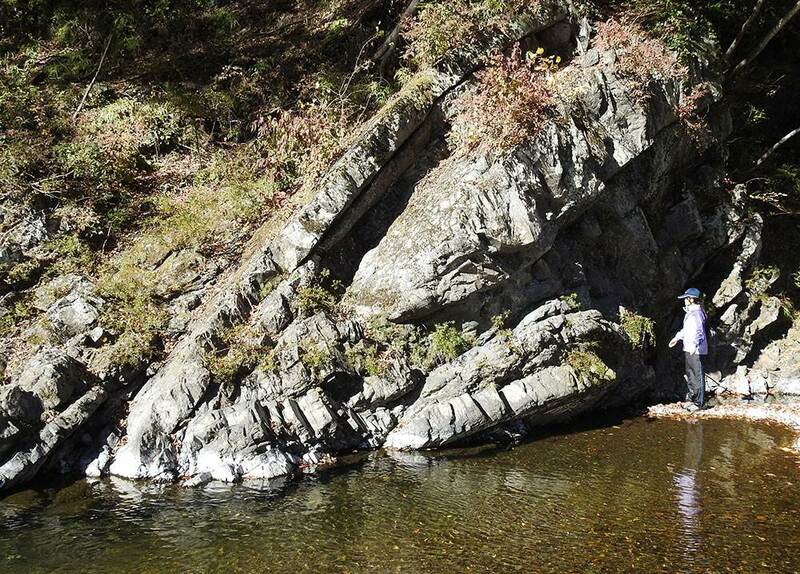 Outcrops of the Cretaceous Atokura Formation, Gumma Prefecture, central Japan. 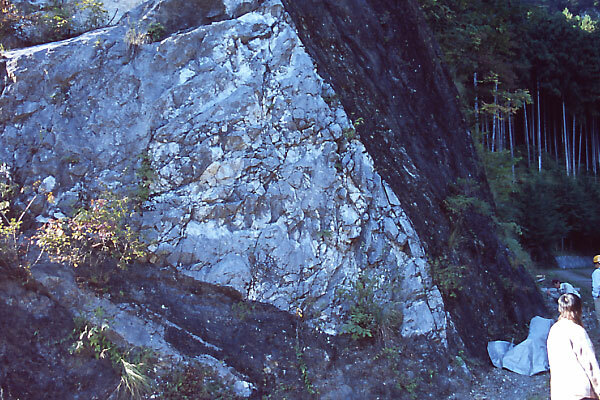 Alignment of fault saddles along the Median Tectonic Line (fault), Nagano Prefecture, central Japan. 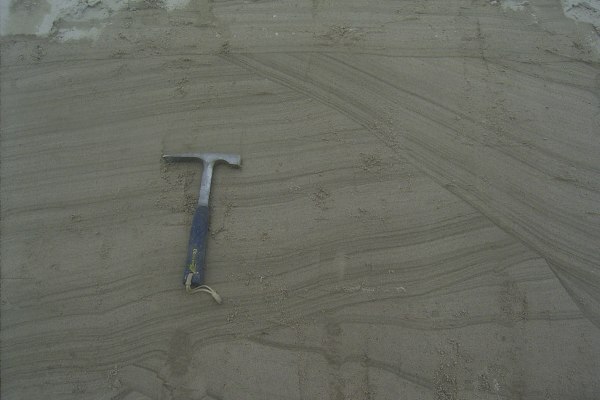 Flexural-slip fold in interbedded sandstone and mudstone. Cretaceous San-yama Formation, Sanchu Group, Saitama Prefecture, central Japan. 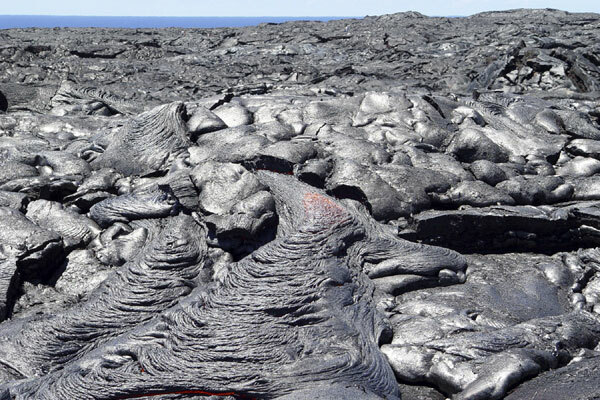 Pahoehoe lava flow of the Kilauea Volcano, Hawaii Island. At the field trip to Hawaiiﾊ (Senior High School, Waseda University). Terraced rice fields reflecting the morning sunlight from the Matsudai seminar house, Wsaseda University. Artesian flow of natural gas is known at several locations in and around the Matsudai campus. 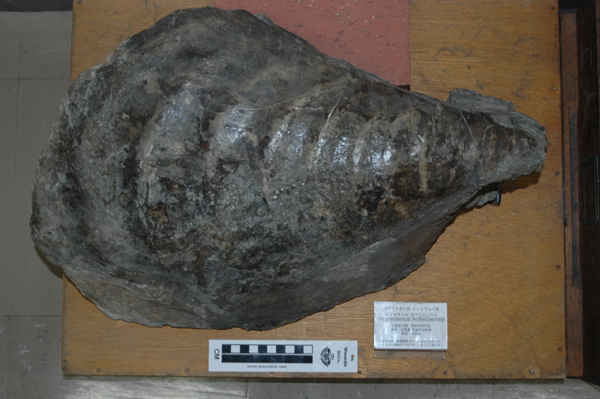 Order AMMONOIDEA, Suborder ANCYLOCERATINA, Family TURRILITIDAE, Turrilites costatus LAMARCK, an ammonite fossil occurred from lower Cenomanian (Upper Cretaceous) formation in Hokkaido, Japan. Mt. 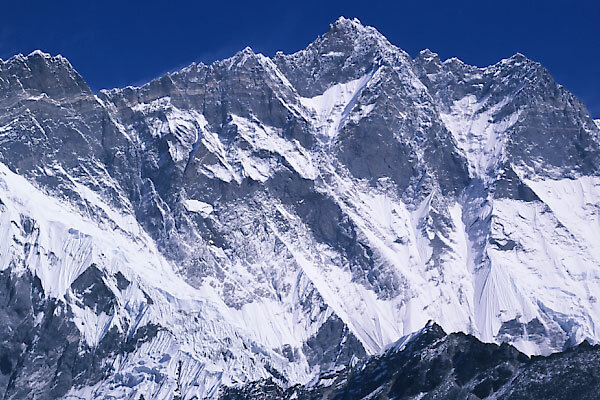 Annapurna I (8091 m), composed of Ordovician Tethys sediments, Nepal Himalaya. Mt. 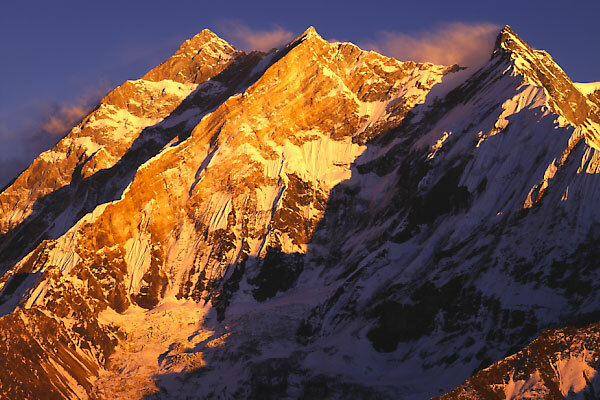 Lhotse (8511 m), Nepal Himalaya. The Yellow Band (Ordovician limestone) is recognized beneath the peak. 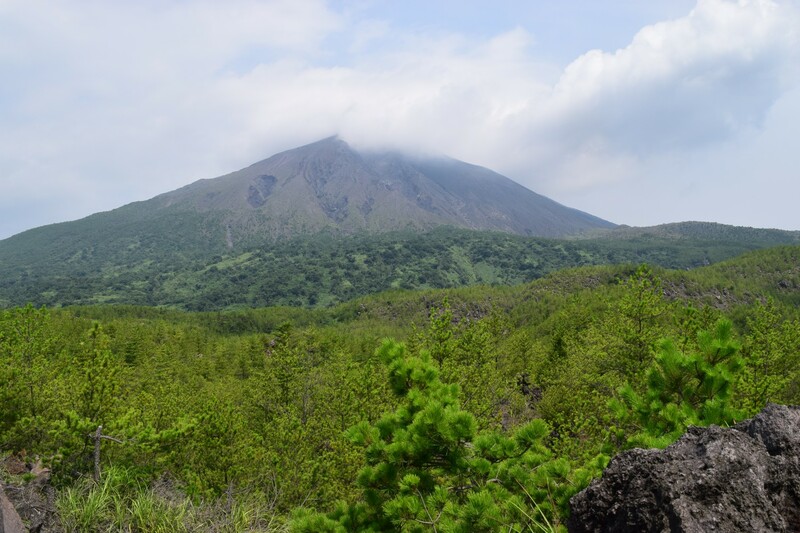 Northwestern view of Mt.Asama (volcano) and Mt. Nishi-Mikabo from Mt. 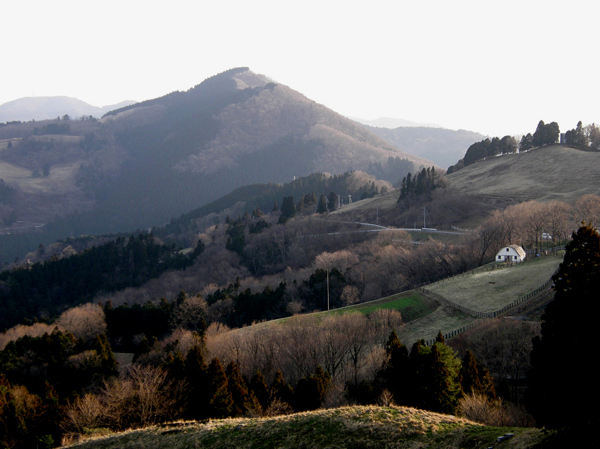 Dodaira which is well-known for klippe structure of Chichibu Group on the Mikabu greenstones and for triangulation station. 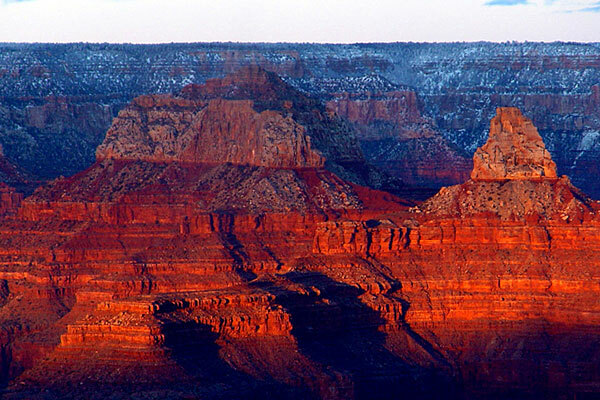 Carboniferous-Permian strata of Grand Canyon in the evening sunlight. 2004 Field trip to western America. Jurassic bedded chert of the Northern Chichibu Belt (accretionary complex), Mt. 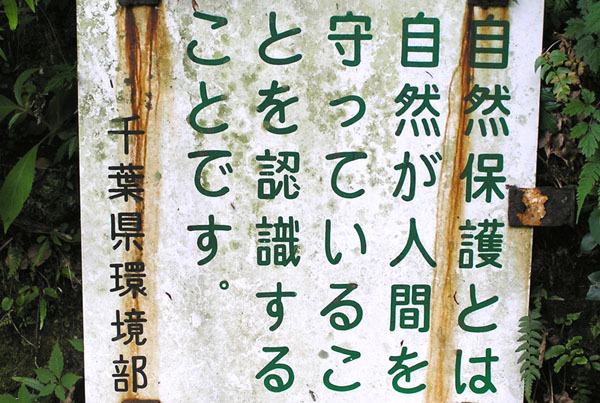 Inafukumi, Gumma Prefecture. 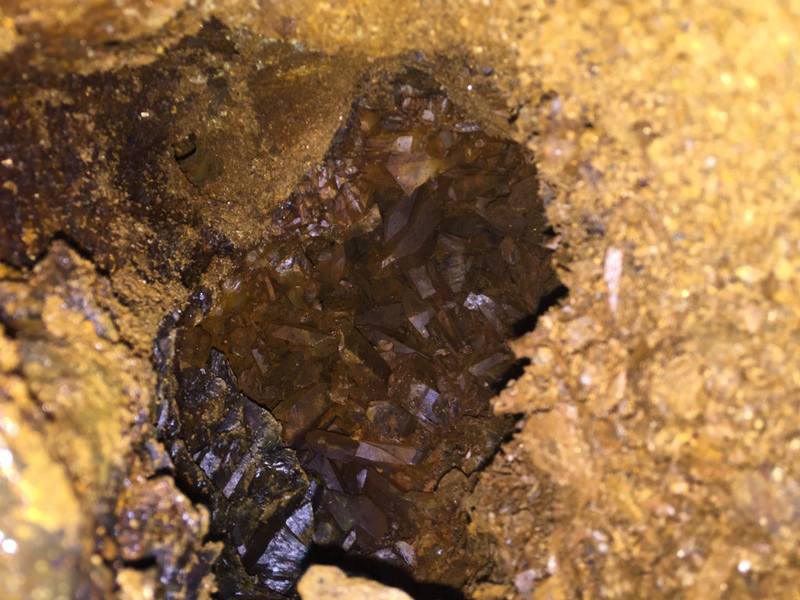 Boudinage with quartz crystal fiber growth in carbonaceous competent layer in the Sambagawa crystalline schist at "Toraiwa;tiger-skin rock" in Nagatoro, Saitama Prefecture. 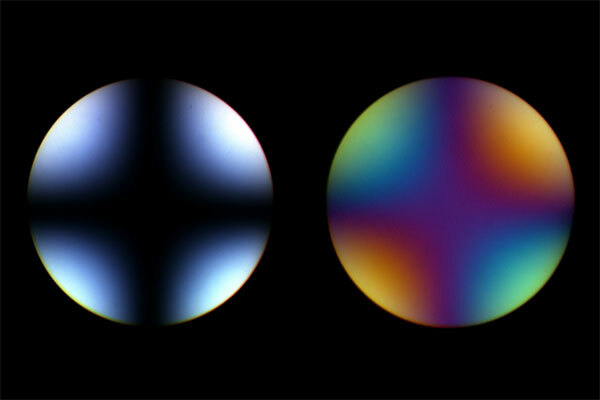 Interference figures of a tourmaline (uniaxial negative mineral). Right figure was taken with a gypsum plate. 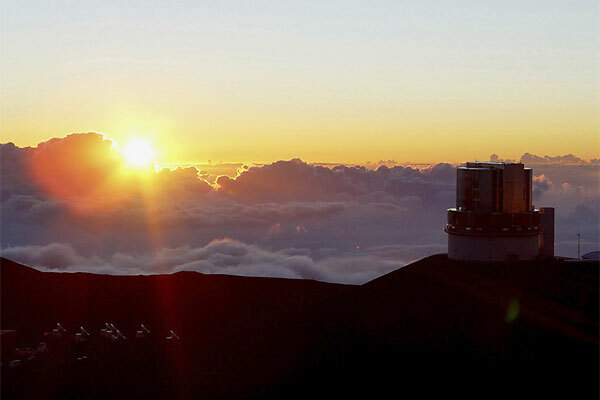 Sunset at the summit of Mauna Kea (4200m) and Subaru Telescope, Hawaii. 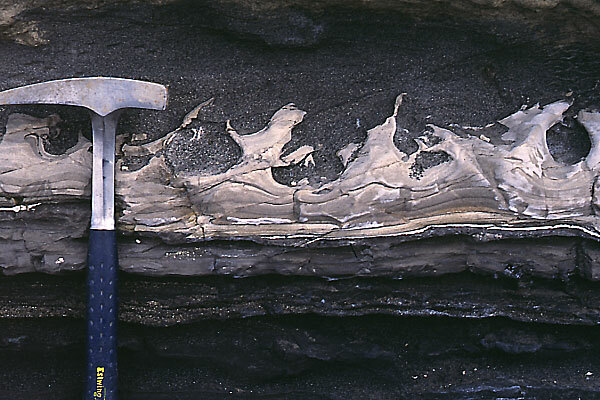 Flame structure observed in alternating beds of tuffaceous sandstone and mudstone, Miocene Misaki Formation, Jogashima Island, Kanagawa Prefecture. Siluro-Devonian acidic volcaniclastic rocks of the Kurosegawa terrane, Mikame Town, Ehime Prefecture. Melange--Limestone block embedded in mudstone matrix. 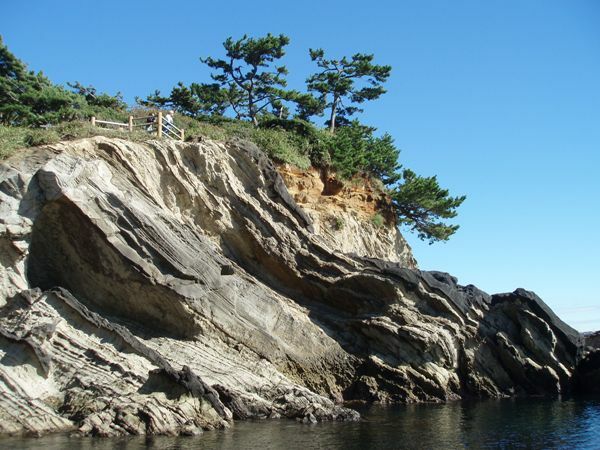 Jurassic accretionary complex, Northern Chichibu Terrane, Saitama Prefecture. Mt. Fuji having a record of eruptions in each 400-500 years from the formation of current beautiful shape at about 10,000 years ago. 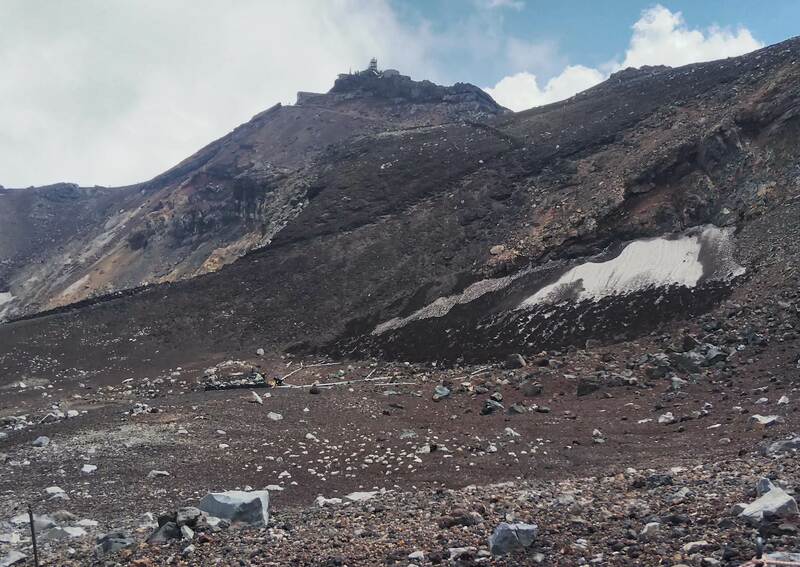 The last eruption took place at 300 years ago (1707). 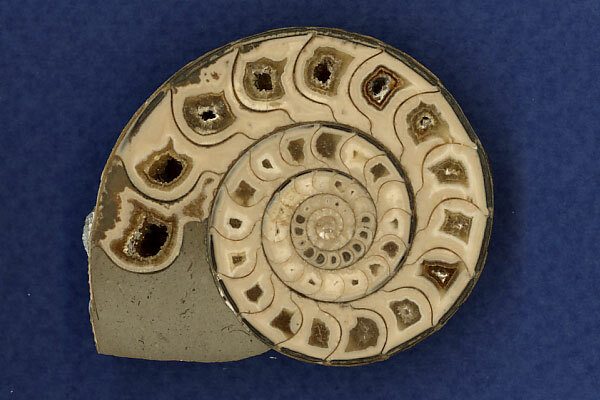 Cross section of an ammonite, Gaudryceras Tenuiliratum(c. 4 cm). Phragomocones (air chambers) are filled with calcite. 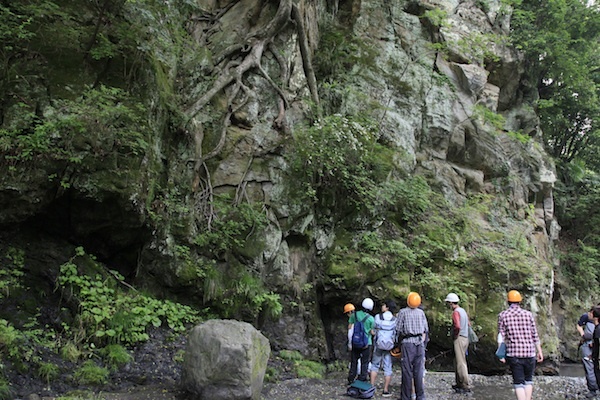 A scene from the excursion in a lecture, at Shimonita, Gumma Prefecture. 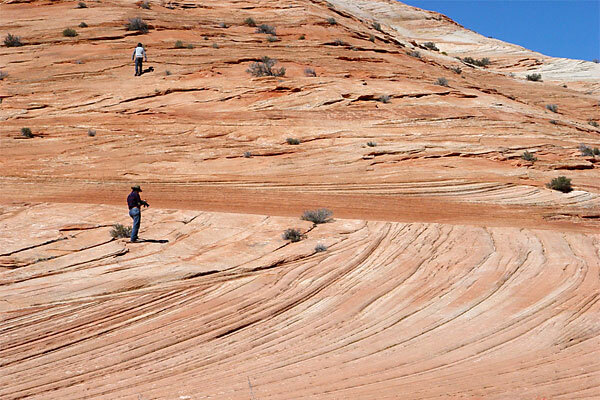 Cross bedding of Jurassic sand dune sediments (Navajo Sandstone) at Zion National Park, Utah. 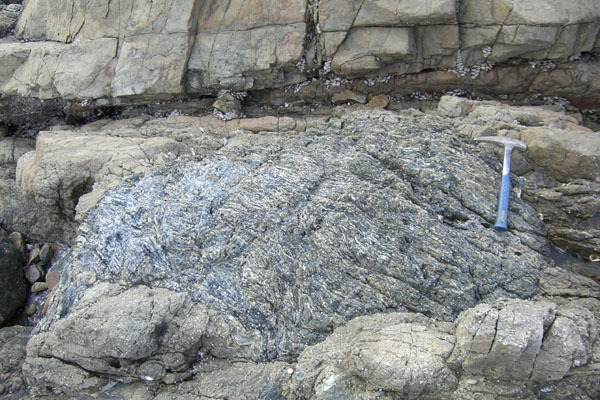 Amphobolite mylonite preserving pillow lava structure colliding paleo Izu arc. 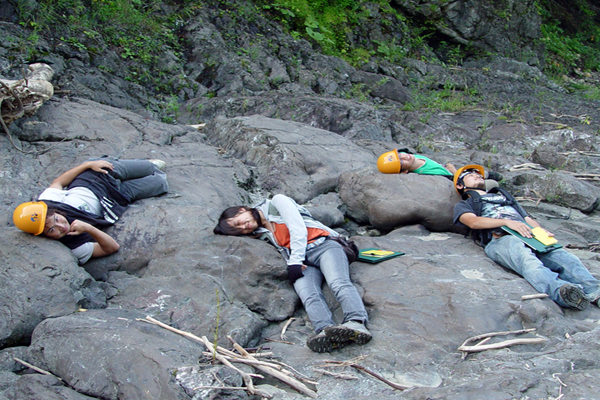 At the outcrop in Nakagawa Onsen, Tanzawa Mountains. 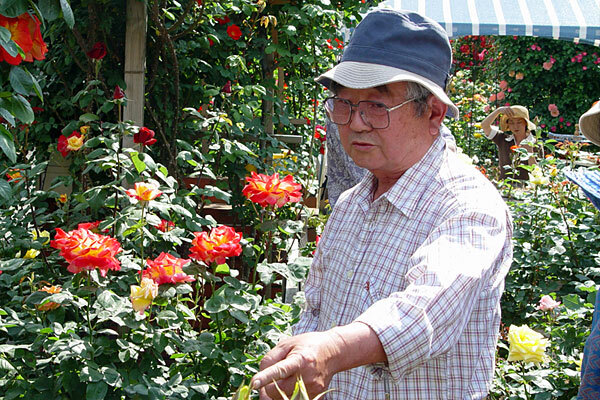 Emeritus Professor Sadao Tsutsumi (mineralogist) in his rose garden. 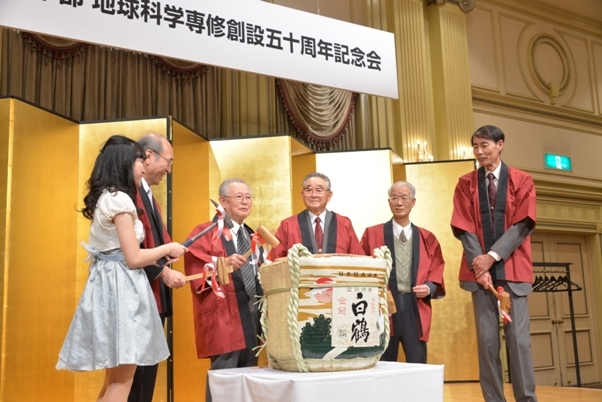 He has held important posts such as a dean of School of Education, vice-president of Waseda University and Principal of Waseda Junior & Senior High School during his tenure (1965-2005). 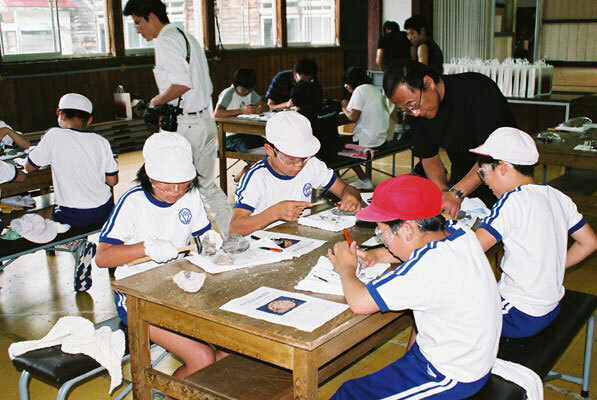 A workshop to give kids hands-on experience with fossils. 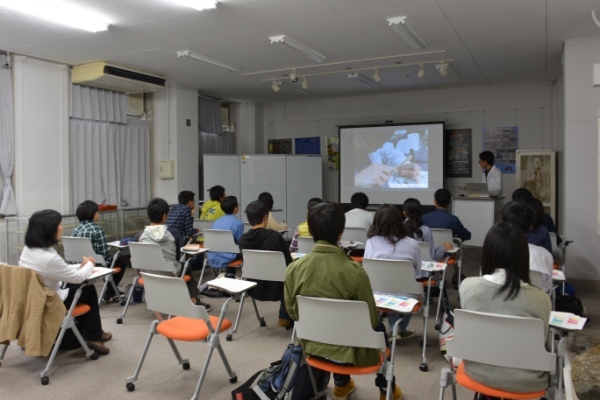 This worksop is held every summer by Department of Earth Sciences, School of Education and Natural Science Division, Open Education Center, Waseda University. 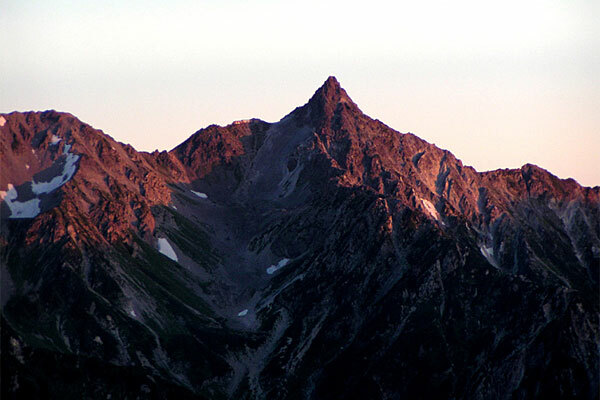 Sunrise view of Mt. 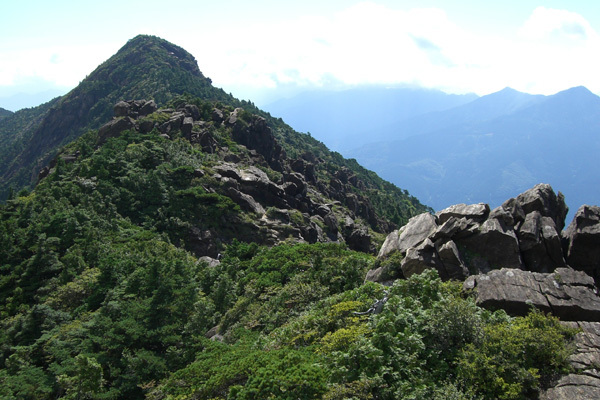 Yarigadake on which crystalline schist of the Hida Marginal Belt crops out. 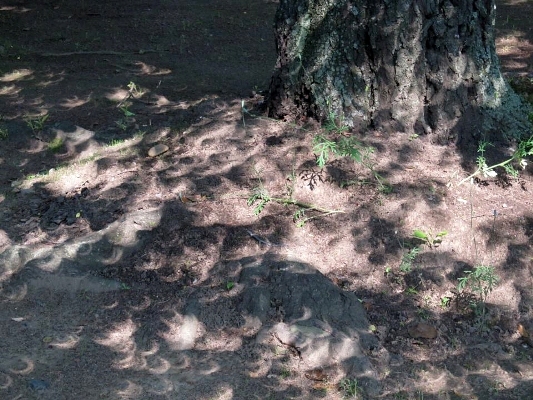 Photo taken from Mt. Chogadake,Northern Alps. A sence from the field trip to the myogi bentonite mine at Gumma Prefecture (HOJUN Co., Ltd.). Relic students(?) 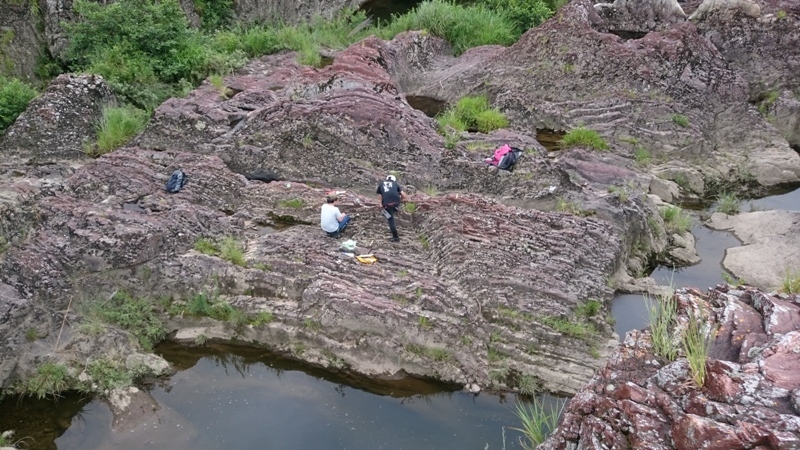 on the pillow lava of lower Sarugawa Formation (Upper Cretaceous) at Iwachishi, Hokkaido. 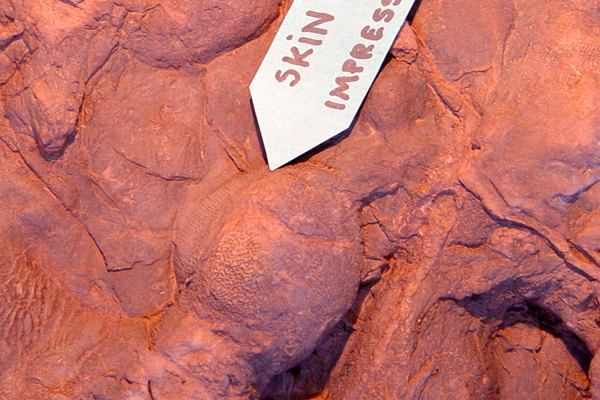 Dinosaur skin impression left behind in the mud about 198 Ma Moenave Formation, Johnson Farm, St. George, Utah, USA. 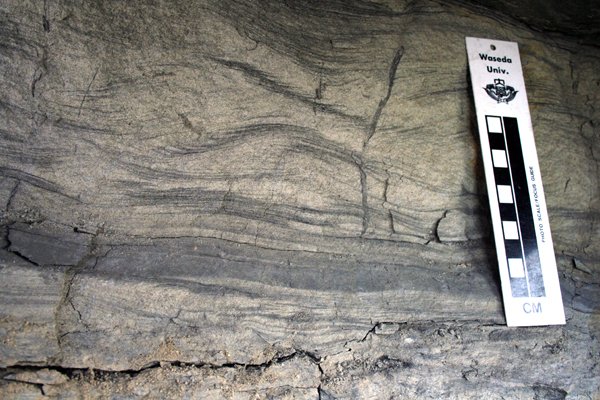 Groove casts on turbidite beds of the Turonian San-yama Formation, Sanchu Group at Ryokami, Saitama. Duplex structure in the Shimanto Complex at Minami-Ise, Mie Prefecture. Iwatsuki borehole sample (3509.8 m depth) of folded mylonite derived from garnet-bearing tonalite drilled in 1971 by NIED. The myronite core suggests that the MTL extends within 500 m to the south of the core site. Incised Meander formed by the tributary (San Juan River) of the Colorado River (Upper Carboniferous). 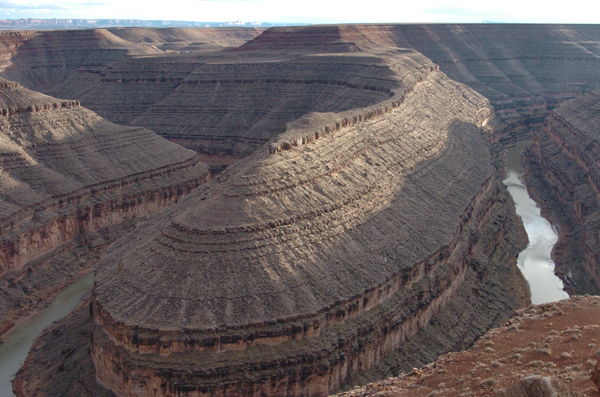 The height seen from base to top is 300 m. Goosenecks State Park, Utah, USA. 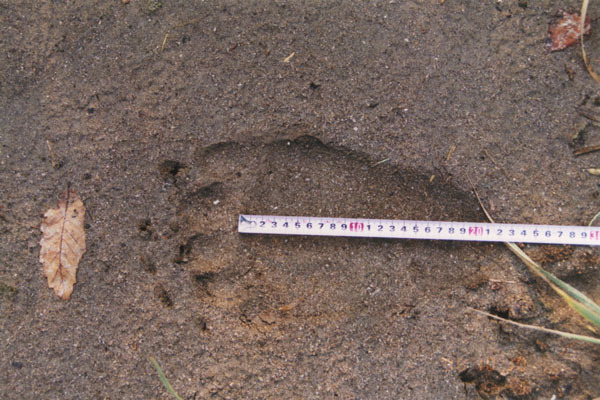 A foot print of a brown bear marked along the Penkeship River of the Teshionakagawa area, Hokkaido, northern Japan. 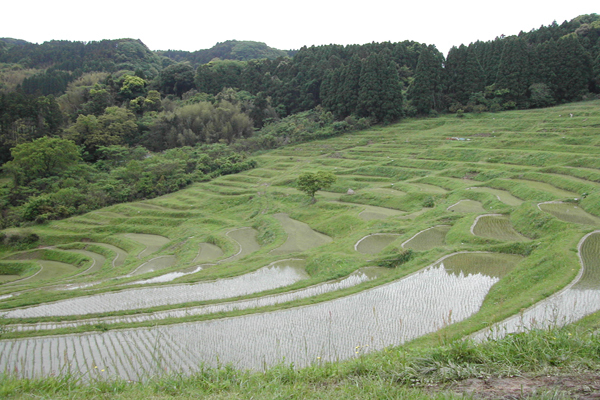 Terraced rice fields on a land slip, Ohyama Senmaida at Kamogawa, Chiba Prefecture. 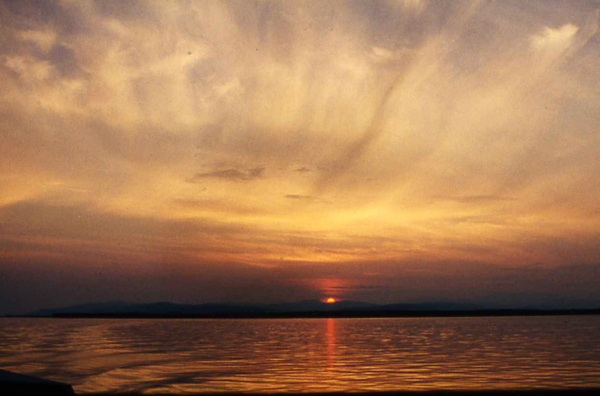 Sunset in the Amur river, Khabarovsh, Far East Russia. The Amur river has a 10th widest basin area in the world (approximately 2,050,000km2). 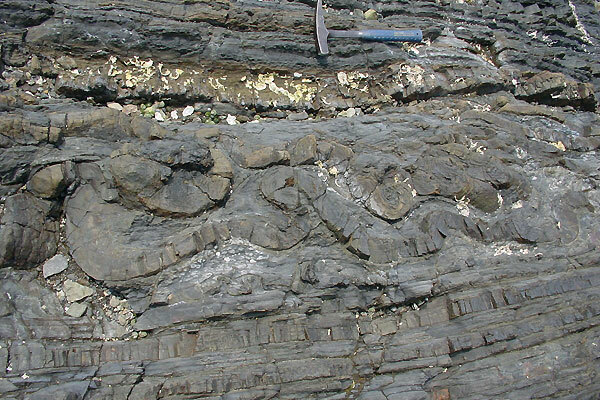 Slump foldings within coherent alternating beds of sandstone and mudstone in the Jurassic Ashikita Group, Tanoura, Kumamoto Prefecture. Columnar joints developed on a side wall of Keogon Falls. 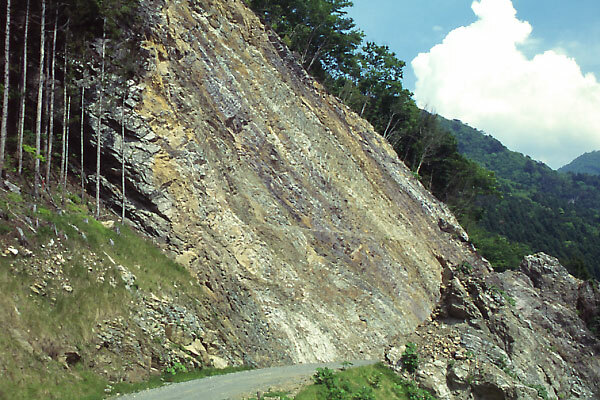 The side wall is composed of Neogene andesite erupted from Mt. Nantaisan. Ray trace in the Kazusa Group (Mandano Fm.). The pit was digged by fluttering rey's fin. 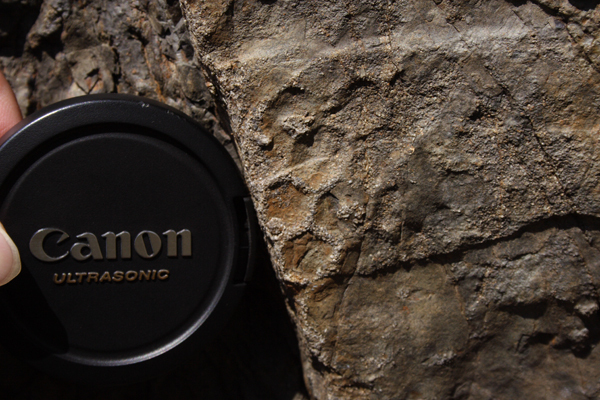 Honeycomb-shaped trace fossil Paleodictyon in the Shimanto accretionary complex, Mie Prefecture. These traces were possibly created by a burrow network of worms or by an activity of bacteria. 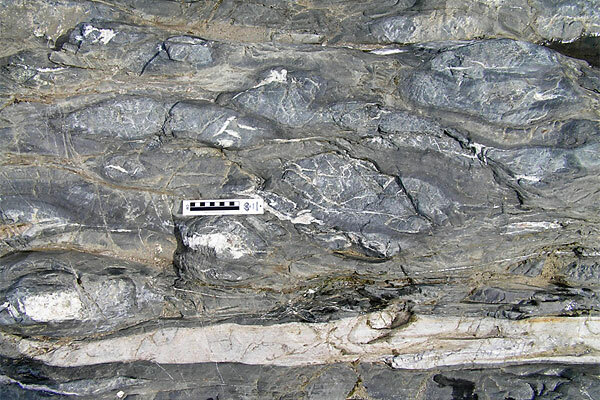 Rhythmite in lacustrine deposits of the Cretaceous Kanmon Group. 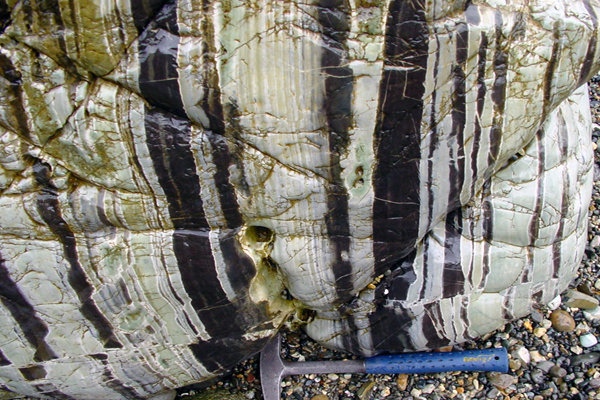 Varve-like lamina are also developed within white and black bands. Murotsu, Toyoura Town, Yamaguchi Prefcture. 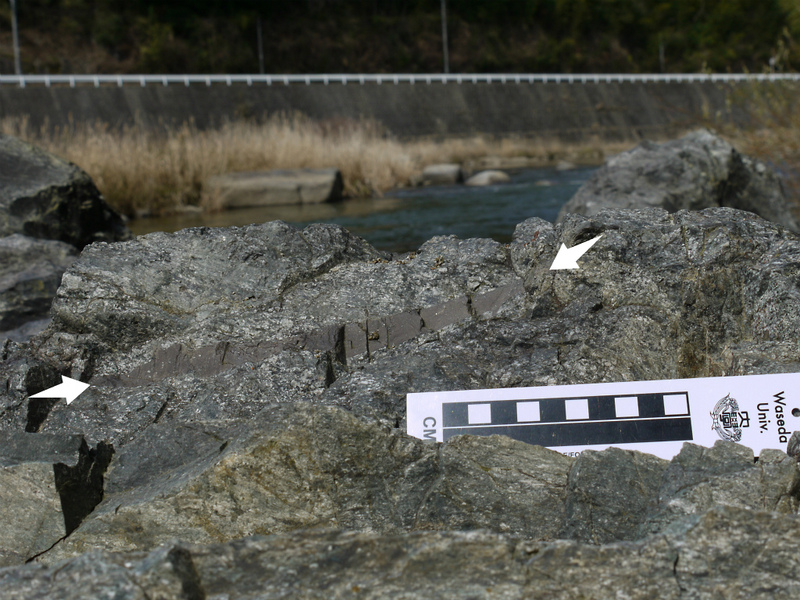 Synformal anticline in the Upper Cretaceous Atokura Formation (Atokura Nappe) along the Nanmoku River, Gunma Prefecture. 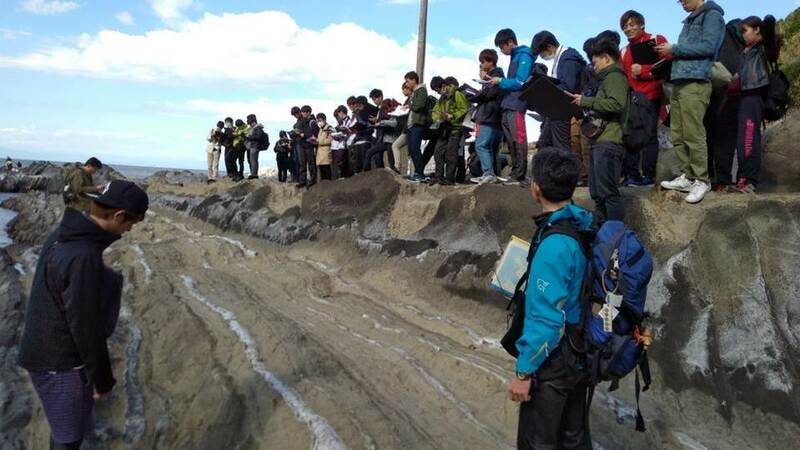 Wave ripples in lacustrine deposits of the Lower Cretaceous Jixi Group, Chengzihe Formation. Jixi City, Heilongjiang, China. 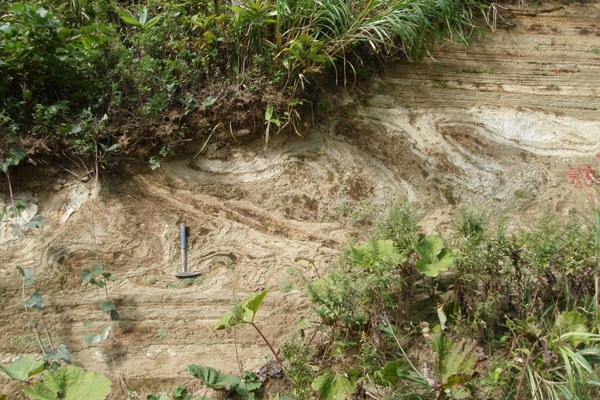 Mud diapir crosscut by sandstone dikes in the Miocene Tanabe Group, Shimanto Belt in the Kii Peninsula. 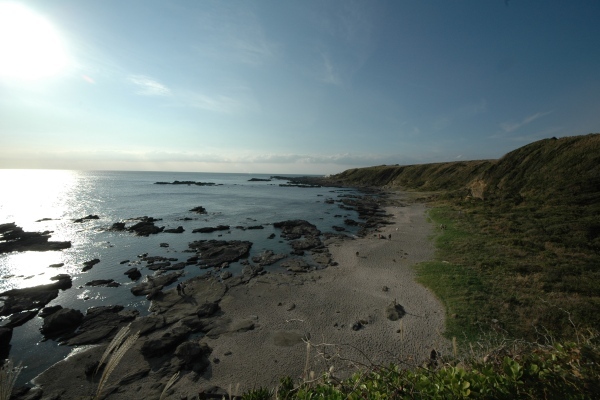 Rias coastline of the Ise-Shima national park in the Kii Peninsula. 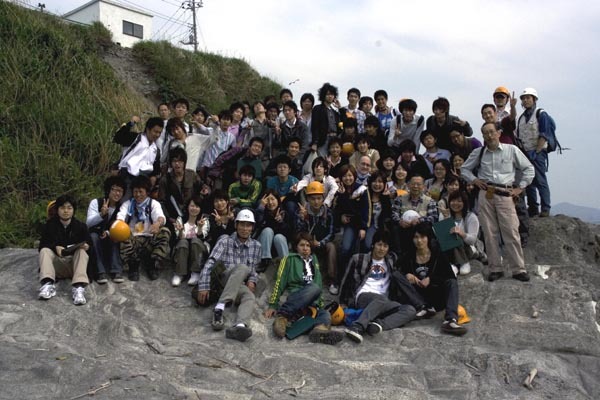 Group photo at the Kamogawa orientation course for new students. The first step in conserving nature is to recognize that nature preserves us. 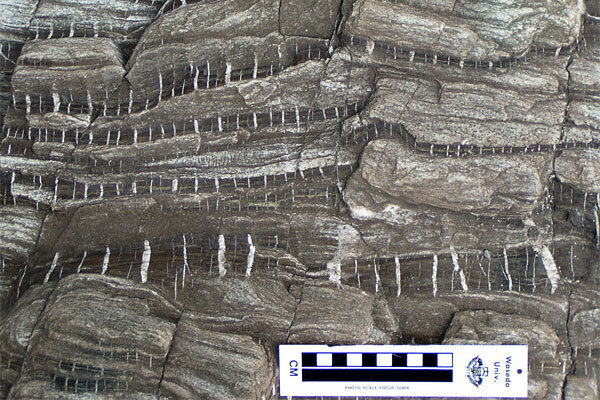 Web structure (an indicator of dehydration) in sandstones of the Chikura Group, Boso Peninslar. 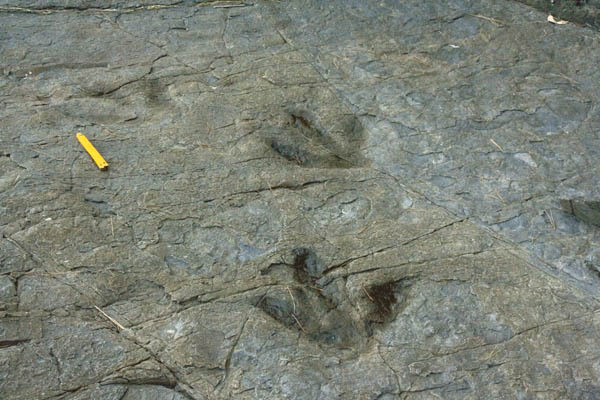 Footprint fossils of a dinosaur (Theropod). The Uppermost Cretaceous Jindong Formation in the Deongmyeng-ri, Gyeonsang-Nam-Do, Korea. 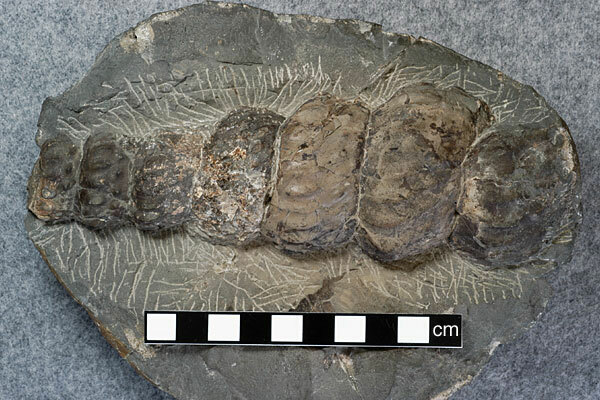 Inoceramus hobetsensis Nagao et Matsumoto from the Cretaceous Yezo Supergroup of Hokkaido, northern Japan. I. hobetsensisis an important index species for the Middle Turonian of Japan. 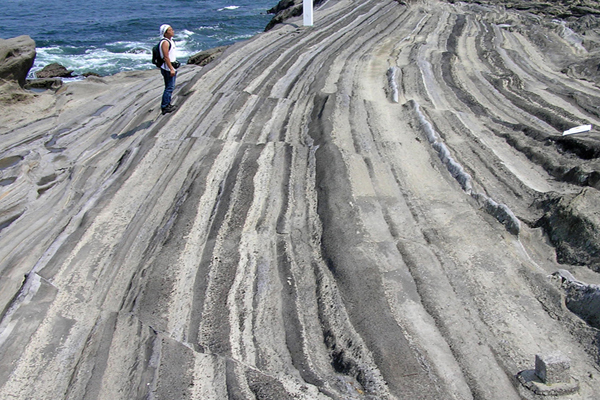 Crosscutting contact between the Misaki Formation (left) and the overlying Hatsuse Formation (right) in Jogashima. This contact is considered to be formed by submarine erosion. the Cretaceous Upper Yezo Group in the Teshionakagawa area, Hokkaido, Japan. This is the diagnostic Lower Campanian species in Japan, and is characterized by the prominent divaricate ribs. Dense accumulations of Inoceramus uwajimensis Yehara. 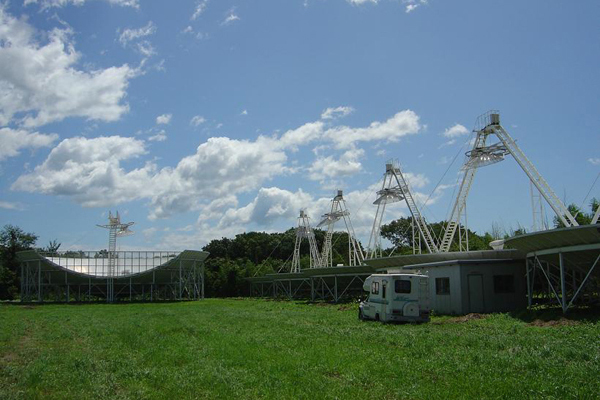 Large radio telescope array at Waseda Nasu Pulsar Observatory. 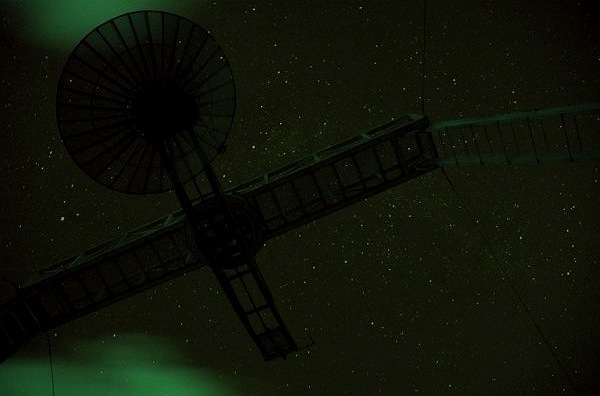 We have carried out the wide-field survey of radio transient phenomena with these telescopes (Eight 20m diameter dish and a 30m diameter dish). 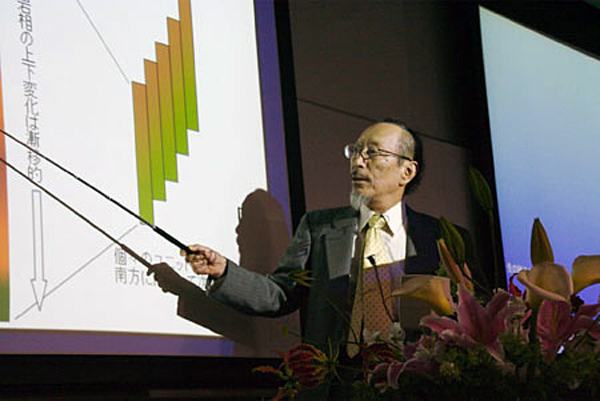 Prof. Saka's farewell lecture on 1 March, 2008. 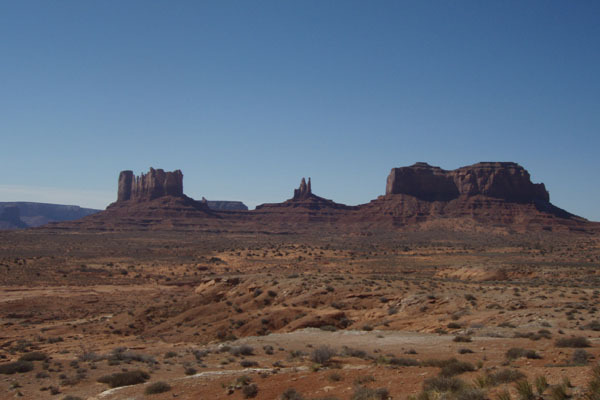 The Monument Valley, composed of the Permian-Triassic strata. 2007 Field trip to western America. Mt. 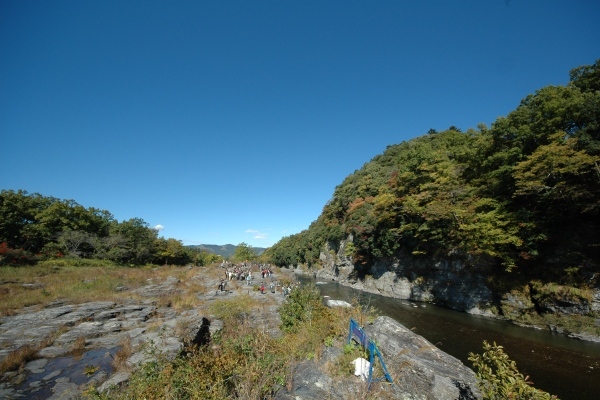 Ogiri-yama area in eastern Chichibu where is well-known for nappe structure of Jurassic Chichibu accretionary complex overlying the Sanbagawa metamorphic rocks. 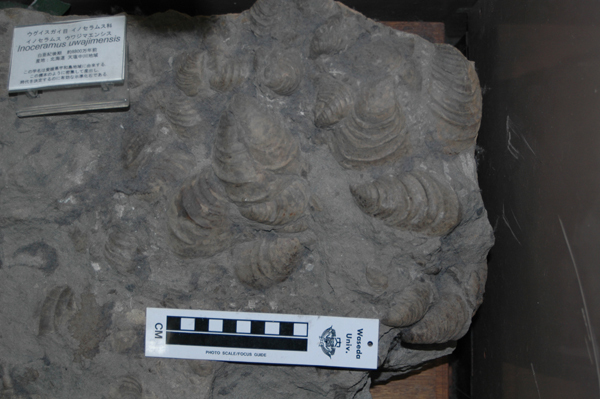 Gigantic ammonites from the Yezo Supergroup, Hokkaido. 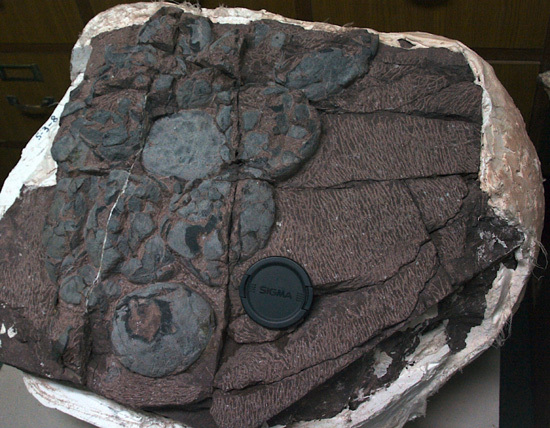 Egg nest of Dinosaur recovered from Gyeongsang Group, South Korea. 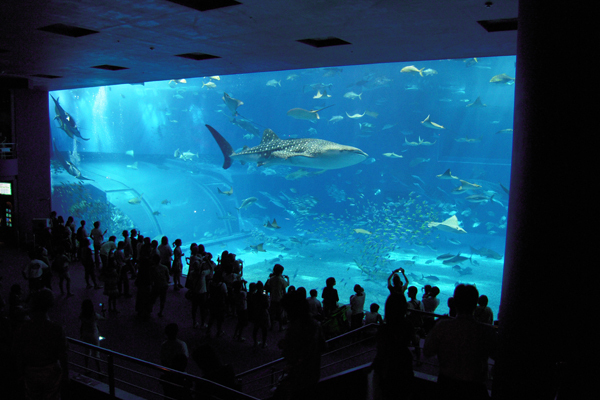 The large tank at Okinawa Churaumi Aquarium, made of an acryl plate (35 m wide, 60 cm thickness). 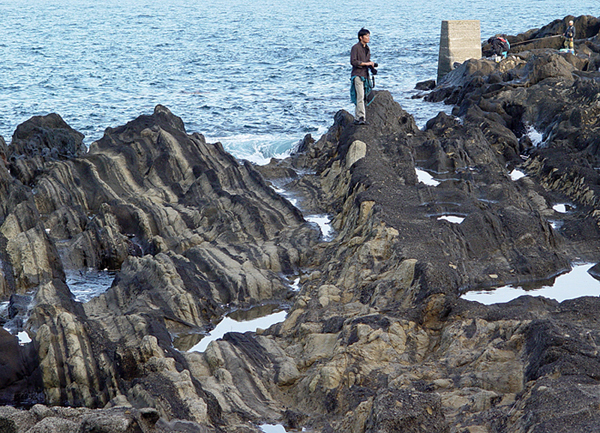 Sazare-ishi - calcareous breccia at Futamigaura, Mie Prefecture. 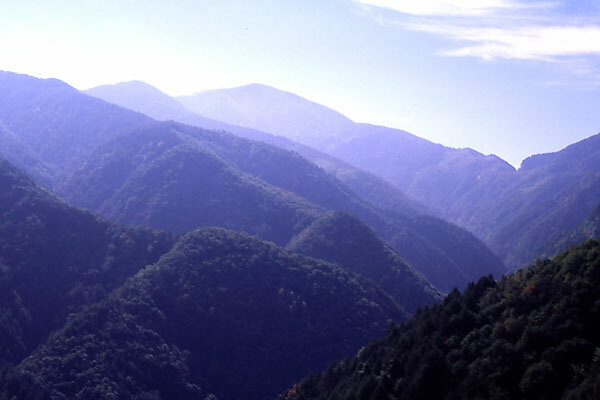 Kiso Mountains viewed from Mt. Tokurayama. 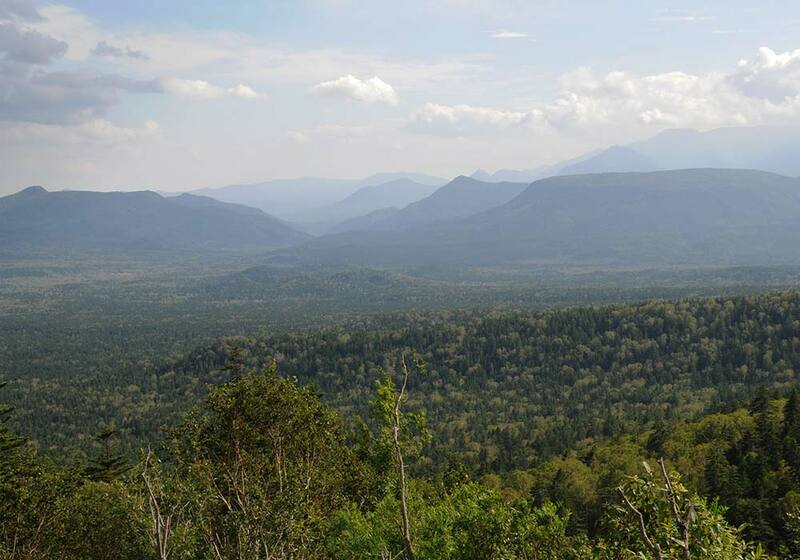 The mountains are composed of the Late Cretaceous Ryoke granitic rocks. 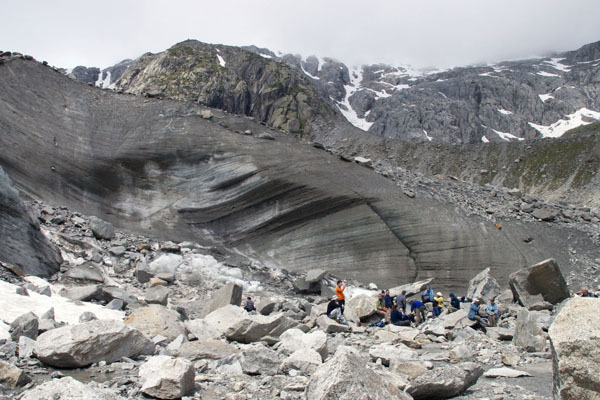 The Damma Glacier located in Canton Uri, Switzerland, and meltout till boulder deposits. Climbing ripple sand in Otadai Formation, Kazusa Group. 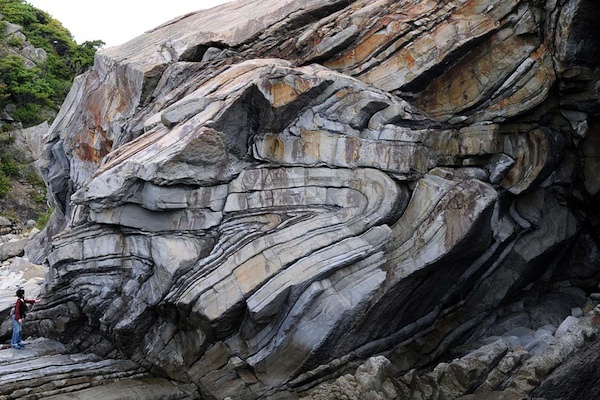 Tora-iwa consists of stilpnomelane schist and its striped pattern on the surface remind of tiger skin pattern (“Tora” means "tiger" in Japanese). At the Nagatoro, Saitama Prefecture. Mt. Kujusan composing composite lava dome. 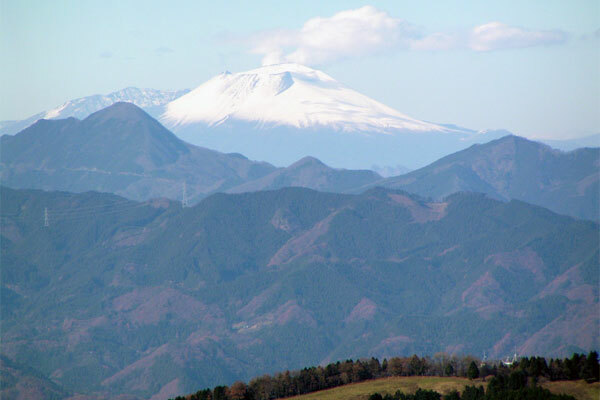 Photo taken from Kuju Kogen, Oita Prefecture. The Mt. Arafune volcano viewed from Shimonita town near Uchiyama Pass. The cliff of lava plateau is composed of 3.4-3.2Ma dark vitric andesite. A meandering river and crescent lakes. 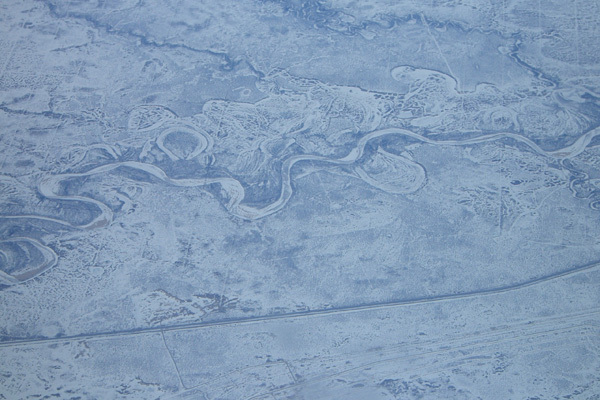 The photograph was taken from the airplane flying above Western Syberian Lowland. Mt. Goryudake (right) and Mt. 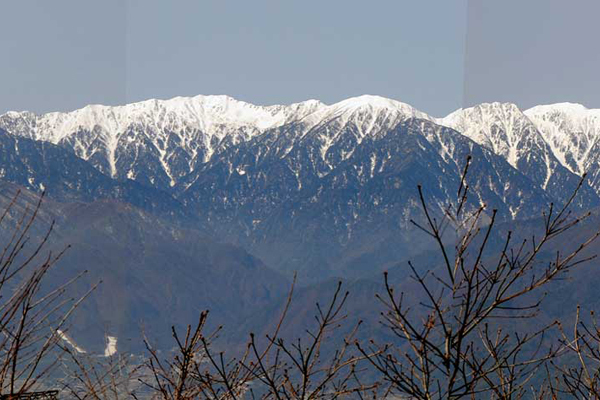 Kashimayarigadake (back left) viewed from Happone, Nagano Prefecture. 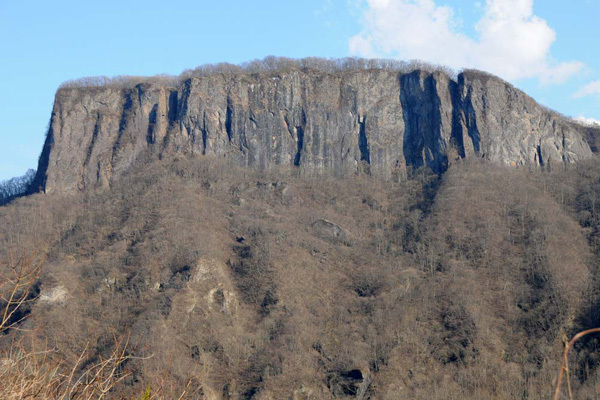 The summits are composed of the Pliocene Igneous Rocks. 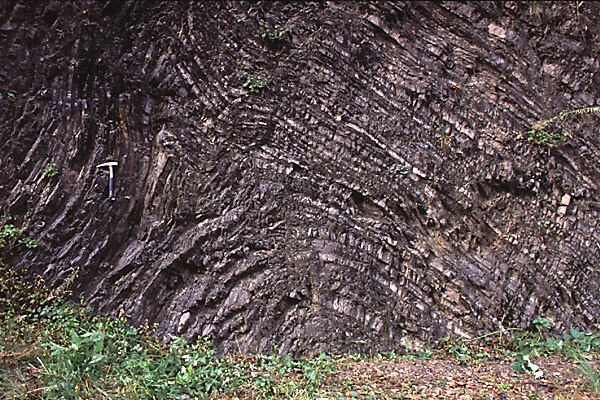 A slump fold in the Upper Cretaceous Onogawa Group, Shitanoe, Oita Prefecture. 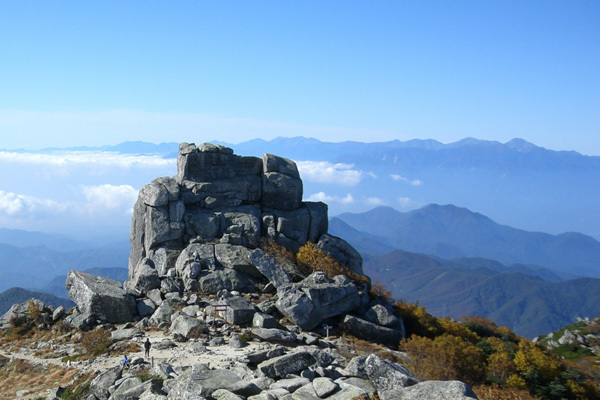 Gozyou-iwa, a tor composed of granite, at Mt. Kinpu-san, west of Kanto Mountains. Mt. 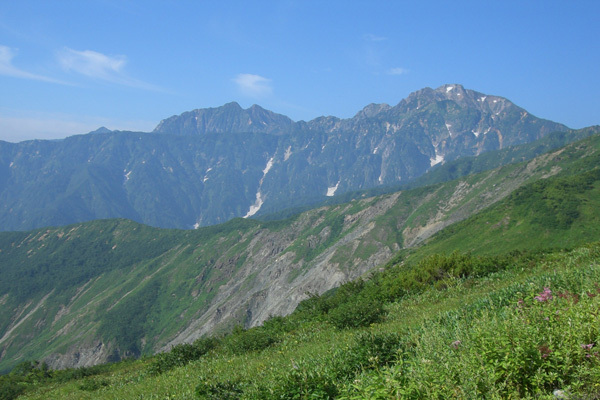 Higashi-akaishi (peak of back left) comprising partly serpentinized peridotite, in the Shikoku mountains, Ehime Prefecture. 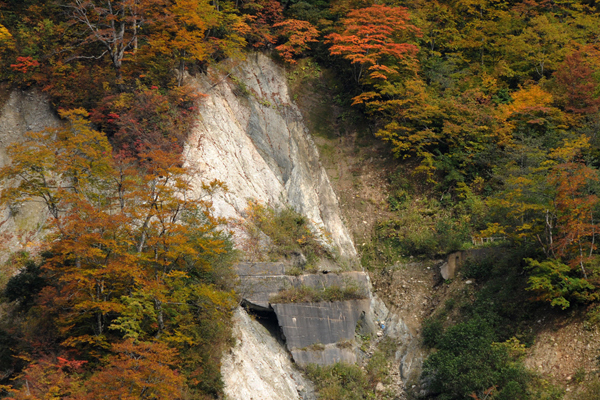 The outcrop of the Atotsugawa active fault system at Magkwa, Toyama Prefecture. JOIDES Resolution came back from IODP Exp. 329 and waiting for IODP Exp. 330 Louisville Seamount Trail at Auckland, NZ. 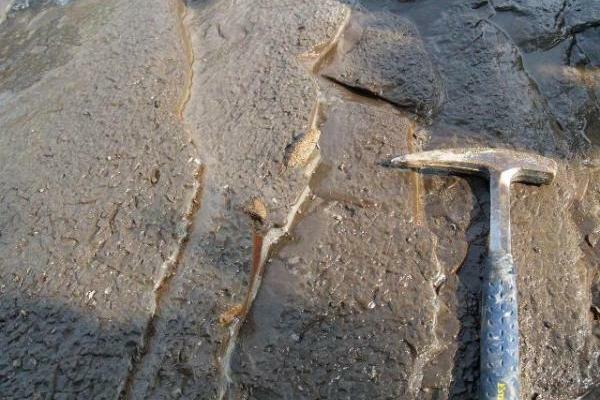 A dinosaur footprint coming out on the outcrop of the Cretaceous Wealden Group distributed in the Isle of Wight, UK. Early Jurassic (Early Sinemurian) extremely fossiliferous bed of “Isnards ammonites slub” exposed in Digne-les-Bains, Alpes-de-Haute-Provence, France. 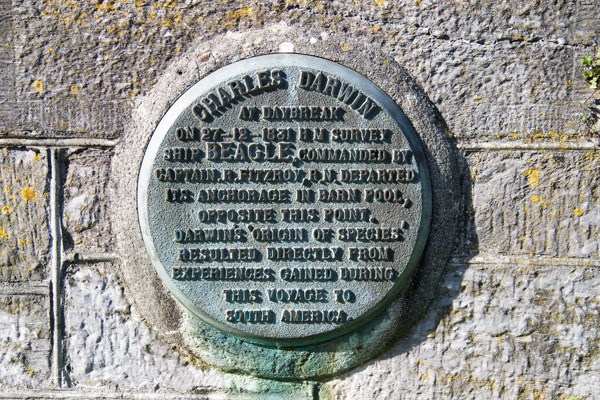 A monument to Charles Darwin and his five-year voyage on HMS Beagle at Plymouth, U.K. 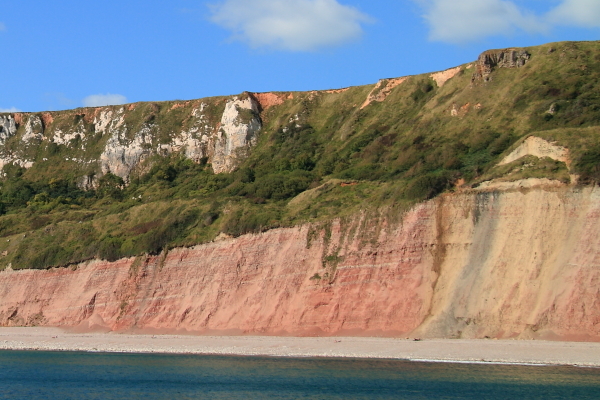 The Triassic New Red Sandstone which is unconformably overlain by the Cretaceous Upper Greensand and Chalk distributed in the world heritage site of Jurassic Coast at east Devon, U.K. The Cretaceous Sanchu Graben, Sebayashi Formation composed of alternating beds of sandstone and mudstone distributed in Ogano, Chichibu-gun, Saitama Pref. 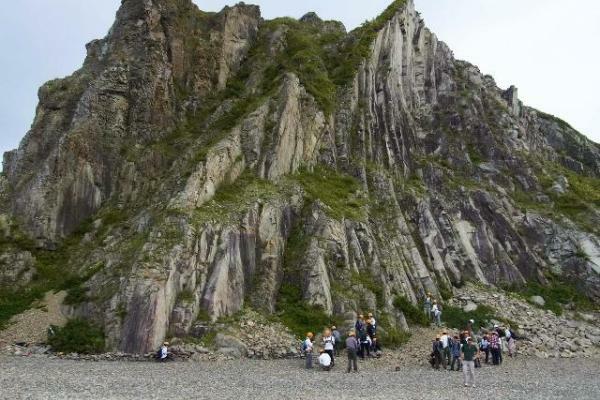 The photo shows a scene of the geological mapping lecture of our department. 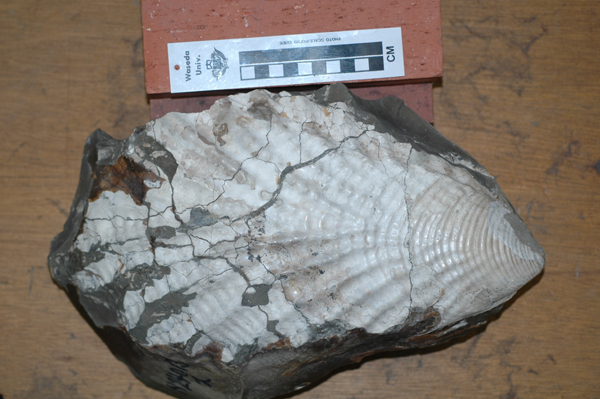 Thick accumulated shell beds mainly composed of disarticulated bivalve shells embedded in the Pleistocene Kioroshi Formation, Shimosa Group distributed in Inzei-shi, Chiba. 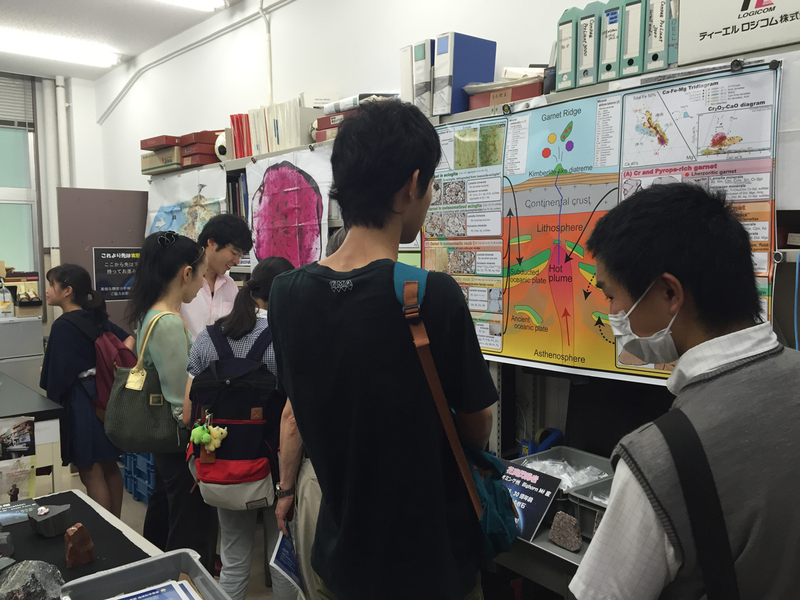 The photo shows a scene of the earth system history lecture of our department. 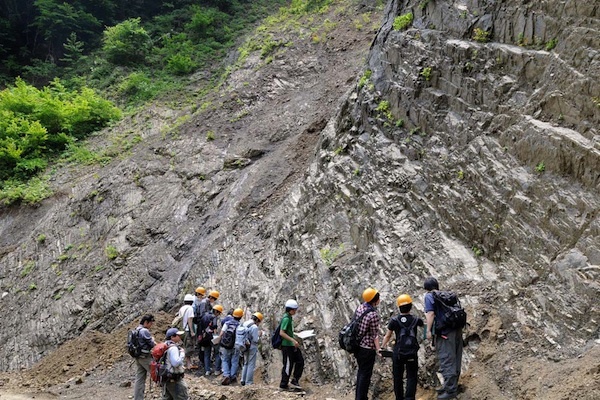 Inuki unconformity bounding the Cretaceous Sanchu Graben and the Neogene Shirasu Formation in Ogano, Chichibu-gun, Saitama Pref. 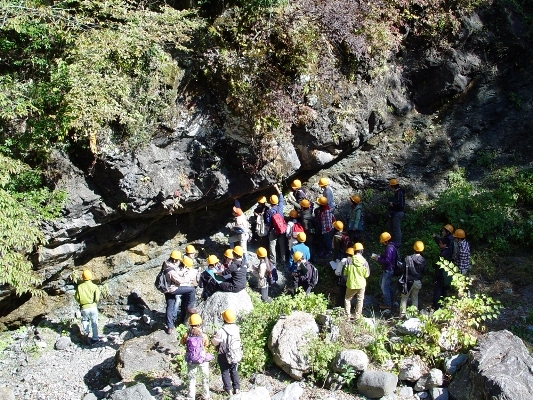 The photo shows a scene of the geological mapping lecture of our department. Significantly folded alternating beds of sandstone and mudstone of the Paleogene Muro Group, Shimanto terrain in Susami-cho, Wakayama Pref. The enormous outcrop of open-pit coal mining at NW Pombetsu River, Mikasa City, Hokkaido. 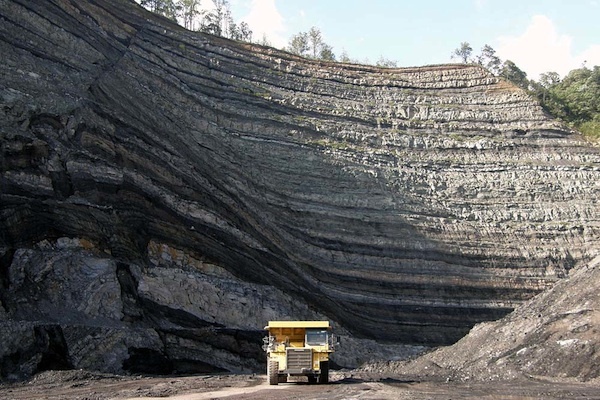 8 coal beds (black bands) have been excavated for fossil-fuel power generation. Courtesy of Sunago-gumi Co. Ltd. 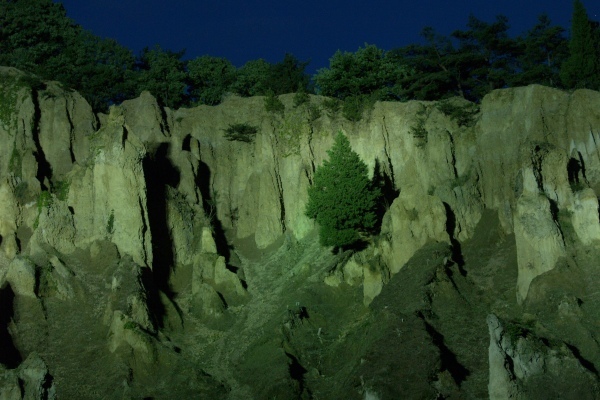 The Upper Cretaceous Atokura Formation cropped out at Shimonita, Amaraku, Gunma. 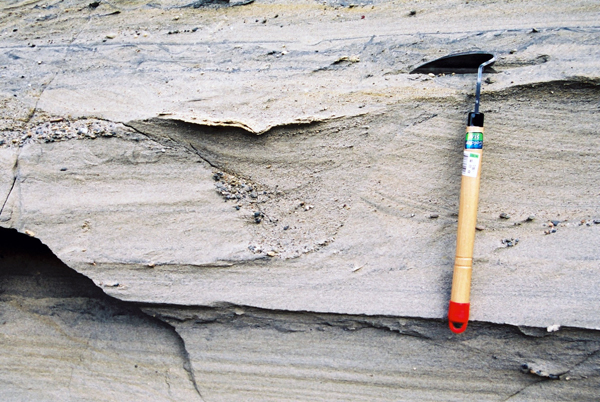 Sole markings (flute casts) are found on the bottom surface of the overturned alternating beds of sandstone and mudstone. 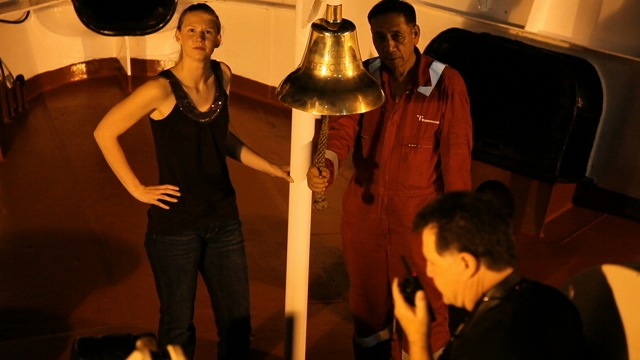 The bell on the bow of JOIDES Resolution celebrating the biginning of the new year. IODP Exp. 330. 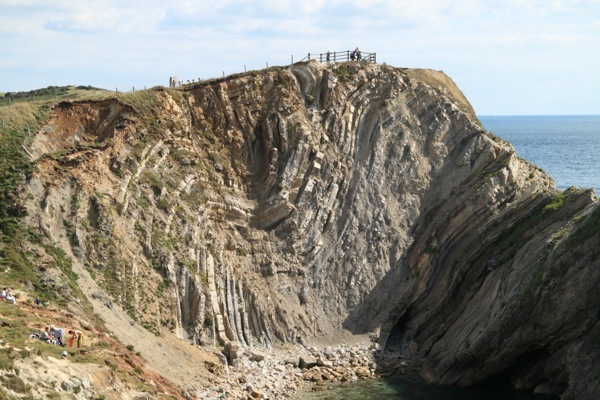 The Lulworth Crumple in Stair Hole distributed in Dorset, southern UK, including the Portland and Purbeck Groups. the Jurassic and Cretaceous boundary would be correlated to the lower part of the Purbeck Group. 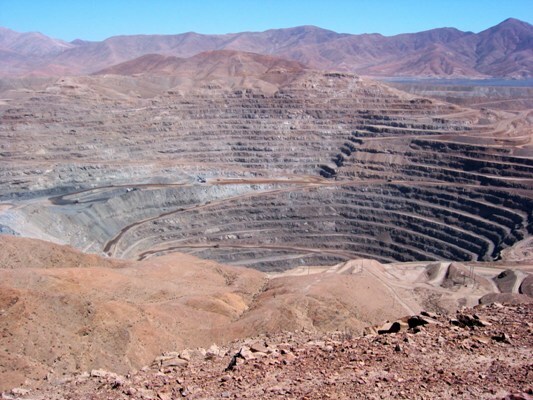 The open-pit mining site of Candelaria mine, Atacama Region, Chile. 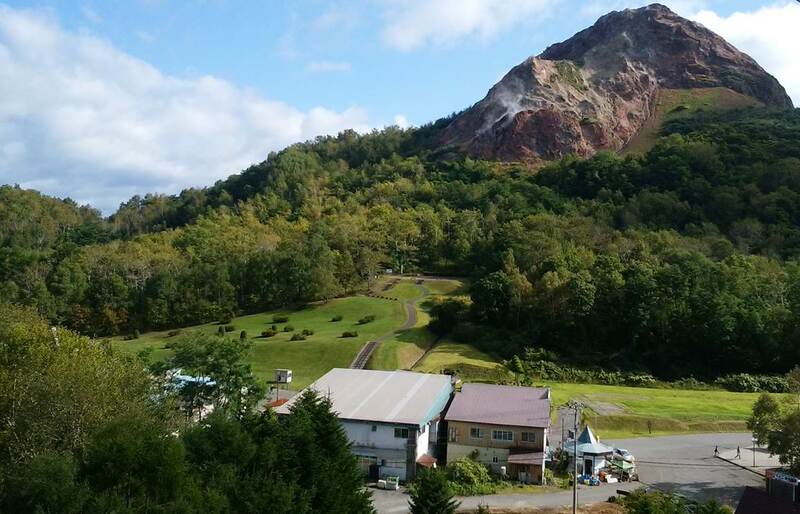 The copper ores mined are refined and exported to Japan. The open-pit mining site of Mt. Whaleback Mine, Newman, Western Australia. The mine has a BIF (Banded Iron Formation) deposit. The ores are exported to Asia including Japan. 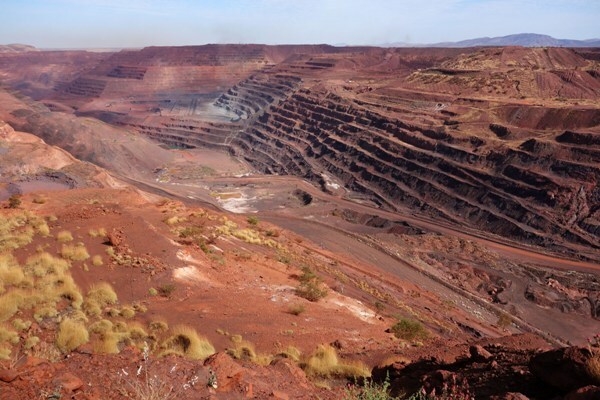 The open-pit mining site of The Super Pit Mine, Kalgoorlie, Western Australia. 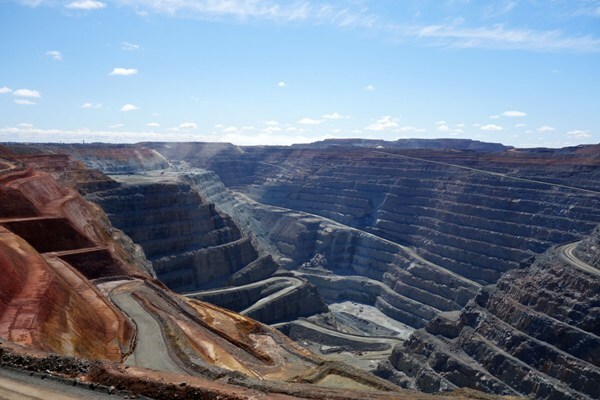 The mine is the nation's largest gold mine and the region which is named "Goldfields" has many gold mines. 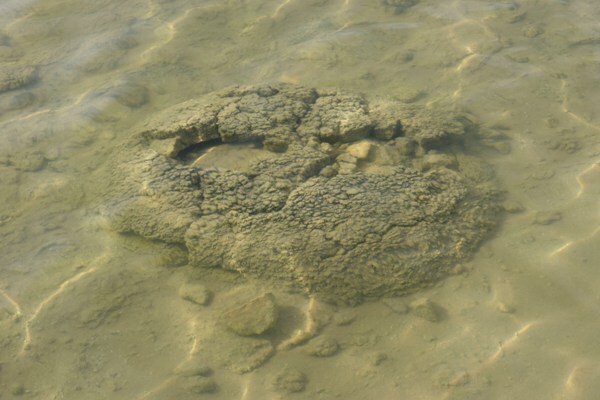 A living stromatolite at Lake Thetis, Western Australia. It has a diameter of about one meter. Typical duplex structure in the Upper Cretaceous Izumi Group in Naruto Town. Exceptional slumping structure caused by impulsive vibration in water at an explosive eruption, Toga Pumice, Oga Peninsula, Akita Prefecture. 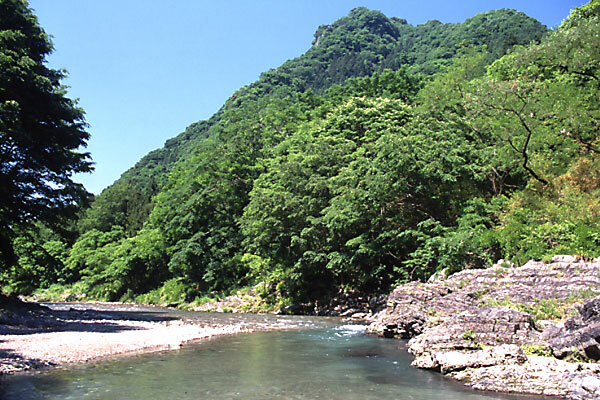 Awa no Dochu (Awa's hoodoo) is a scarp, which formed by abrasion of a fluvial terrace of the Yoshino River along the MTL. 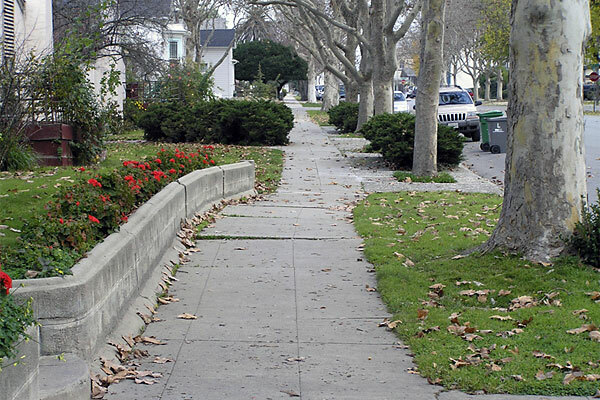 The scenery has been familiar to many people from past to present, but now landscape is changing due to the decrease of erosion. 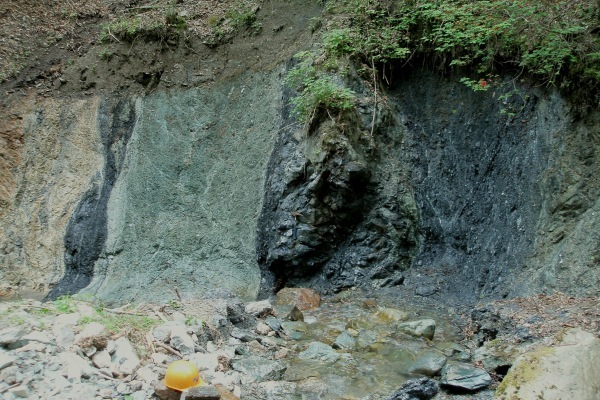 Trough cross-stratification in upper shoreface facies of the Dainichi Formation, Kakegawa City, Shizuoka Prefecture. 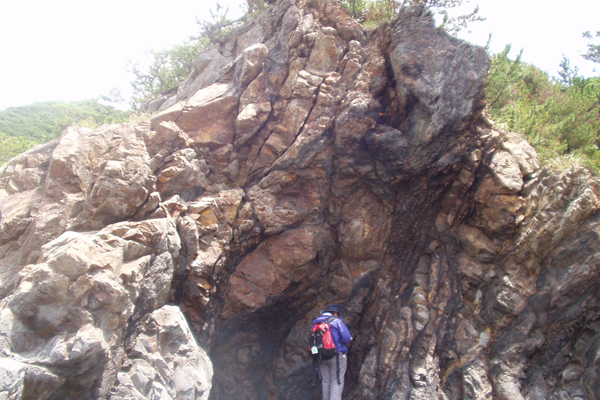 Porphyrite dike with platy joints in Enrumu-misaki, Samani Town. Overview of the southern Jogashima (Miocene-Pilocene Miura Group), Miura Peninsula, Kanagawa Prefecture. Many field excuresions for education are carried out at this place in autumn every year. Schist with distinct schistosity planes, known as "tatami mattress of rocks (Iwadatami)", under a blue sky of autumn, Nagatoro, Saitama. 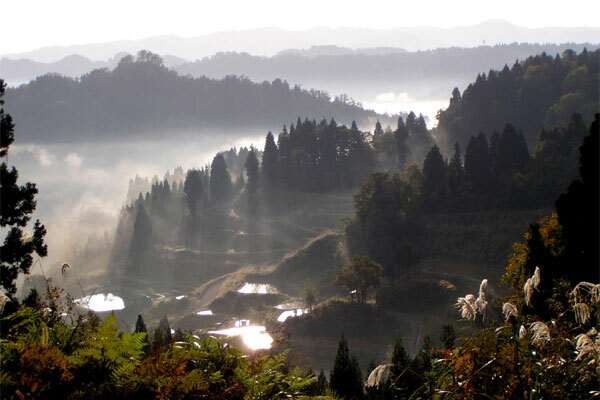 The scenery is famous for beginning of modern geology in Japan. Glendonite into the Miocene Teradomari Formation, Niigata Prefecture. 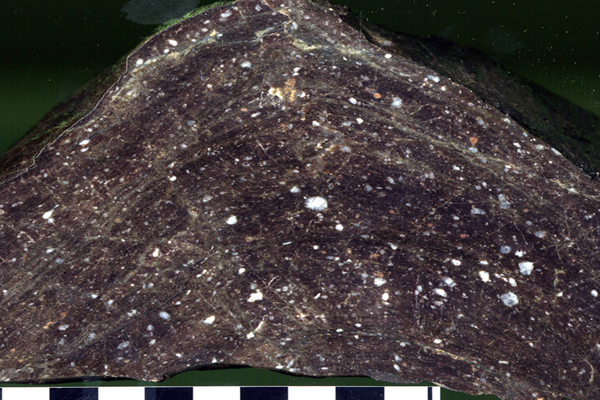 It is inferred that glendonite is a calcite pseudomorph after an authigenic mineral during pre- or early diagenesis. 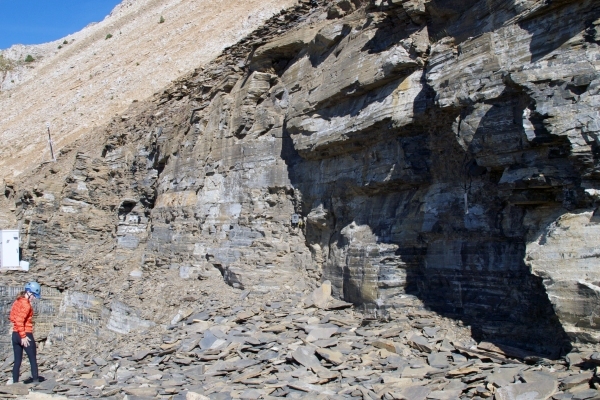 Outcorp of the Canadian Burgess Shales (Walcott Quarry), the site that first defined the Cambrian explosion. Starry night sky photo on the radio telescope at Waseda Nasu Pulsar Observatory. 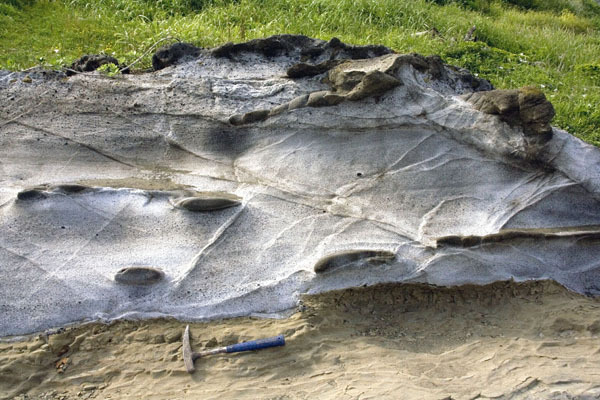 Lithologic boundary between the Chinen Formation and Ryukyu Group in the Miyagi Island, Okinawa Prefecture. 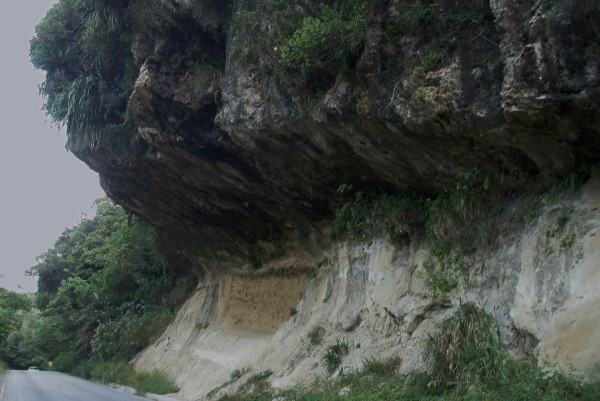 The Ryukyu Group, consists of travertine, overlie the Chinen Formation, mainly consists of sandy rocks, and siltstone dominant Shimajiri Group. 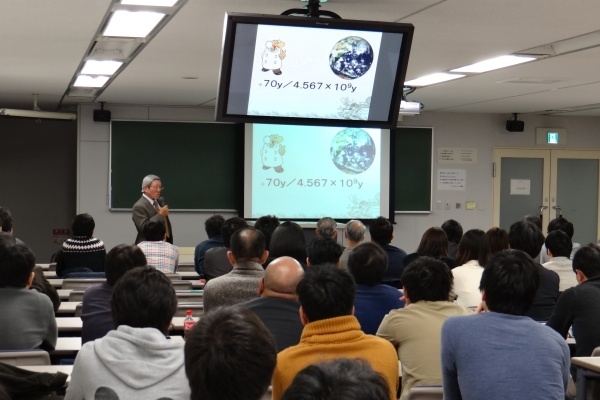 Farewell Lecture, Professor Mamoru Enjoji, " I enjoy a life with fairies in minerals," on 8 March, 2014. Outcrop of the Wabuka Formation, Muro Group in the Tanami, southern Kii Peninsula. 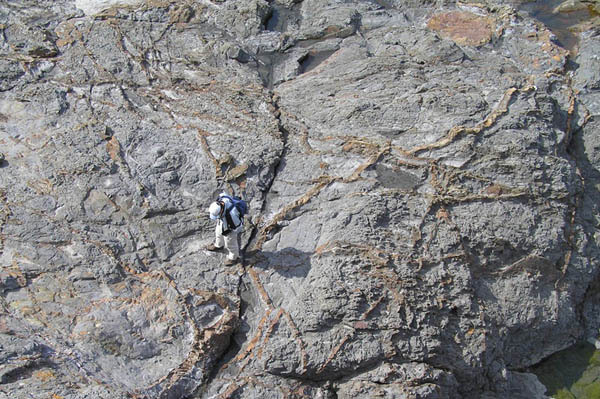 Grey rugged rocks on the plane, which has been portrayed as "gibbeted heads (Sarashikubi)", are sandstone-conglomerate blocks scattered into mudstone. 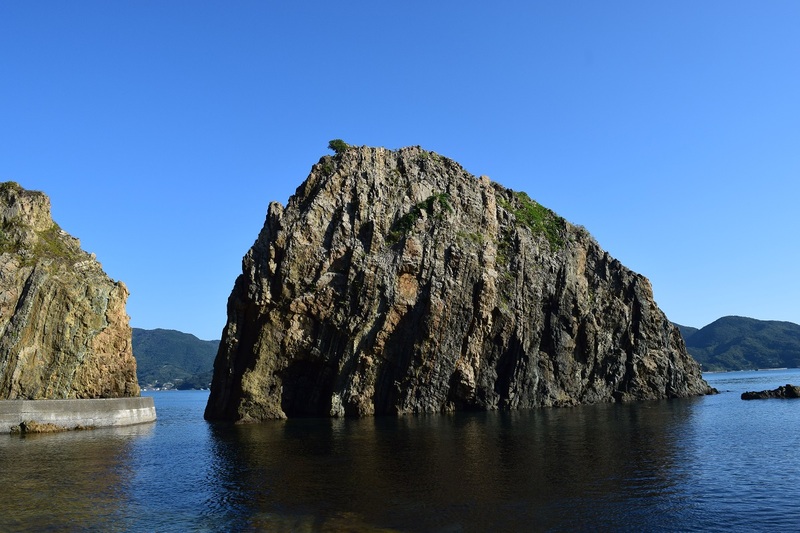 Lamprophyre dykes located on the Seto Inland Sea in the Shirotori, Kagawa Prefecture. 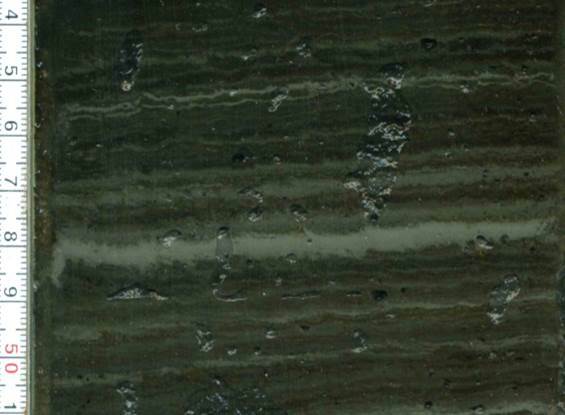 We can enjoy a beautiful scenery of zebra color that the blackish lamprophyre injected as sheeted dykes into the Shirotori Granite (Ryoke Granitoids). 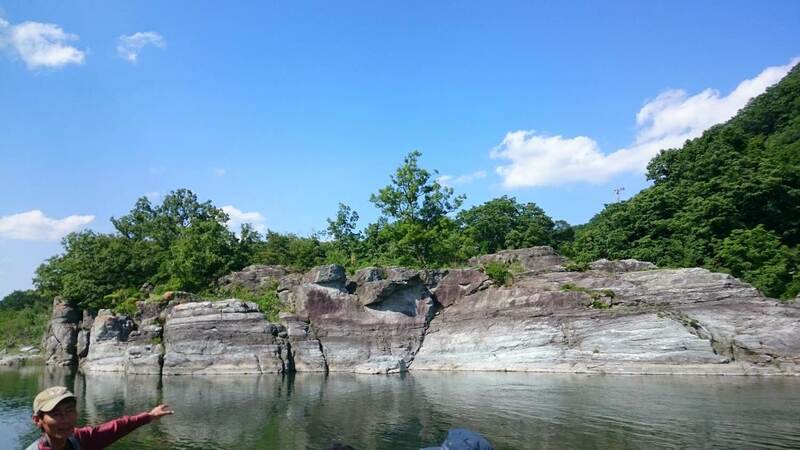 This outcrop was designated as a natural monument in 1942. 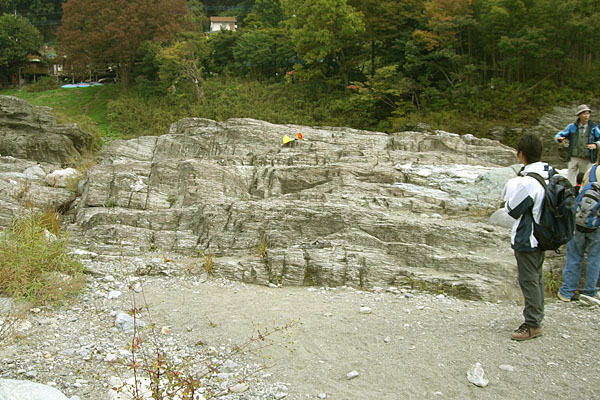 Outcrop of Median tectonic line (MTL) in the Kotoge-zawa of Oshika village, Nagano Prefecture. 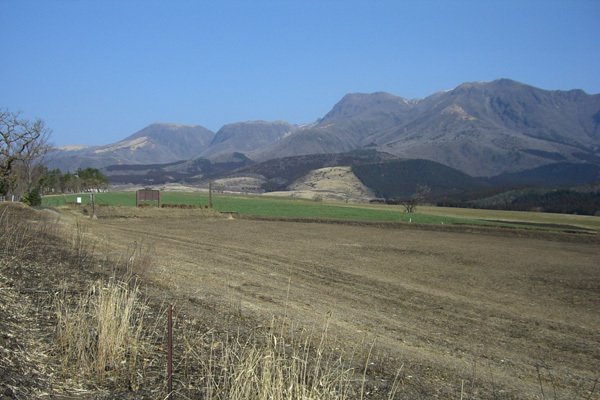 View facing north of the MTL fault zone, divided into inner zone (left side) and outer zone (right side) of the Southwest Japan. 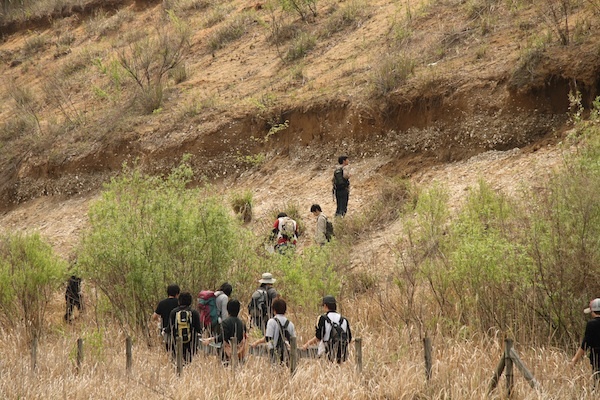 Early summer field trip of our department (Guide: Prof. Hideo Takagi). 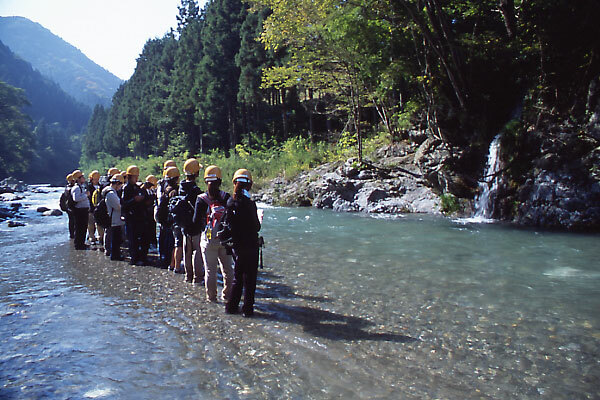 Professor Hiromichi Hirano training senior students in Shumarinai river, Hokkaido. He passed away at age of 68 in May 5, 2014. 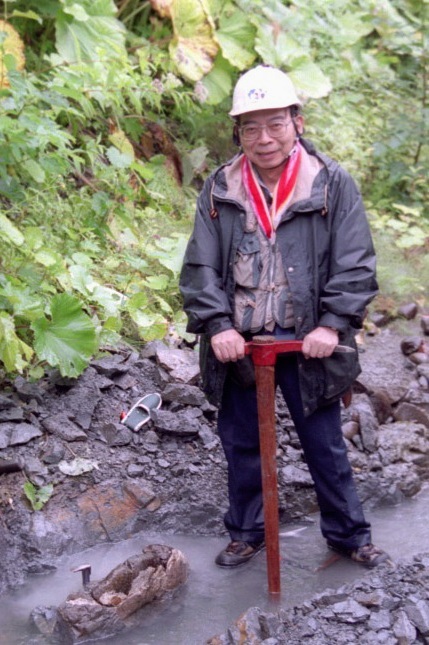 Ansei creter of the Tokachi volcanic Group, Hokkaido, Japan. 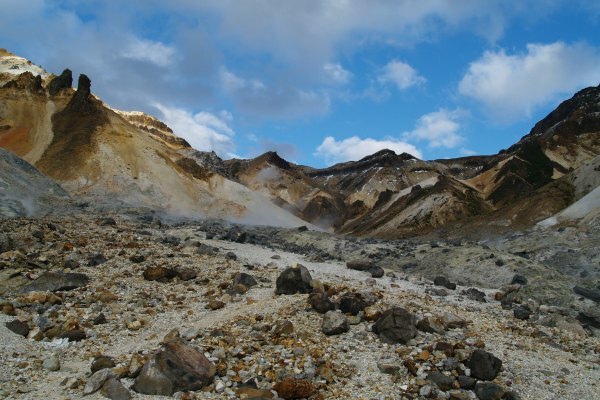 This is regarded as a creter of the Ansei eruption in 1857.The famous hot spring "Hukiage" is in the nearby neighborhood. 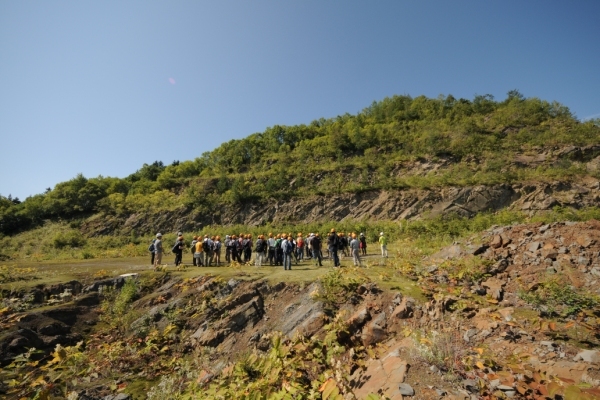 The upper part of Mikasa Formation is largely exposed in Gensekiyama quarry (Mikasa, Hokkaido). This picture was taken during the 2014 field trip, which is traditionally offered to junior students in our department. 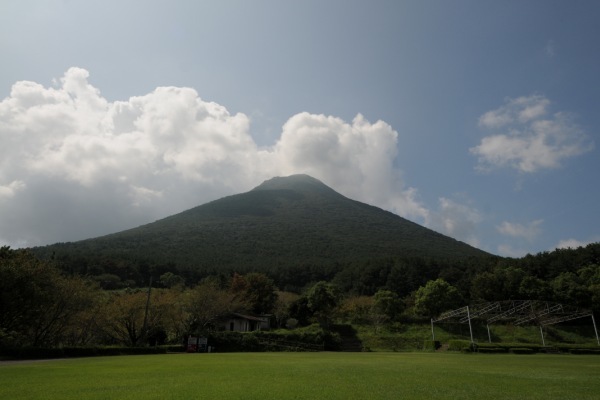 Kaimondake volcano, known as "Fuji Yama of Satsuma", is a active volcano situated in Satsuma peninsula, Kagoshima, Japan. It is not a simple stratovolcano, but a double volcano which consists of a basaltic stratovolcano and a andesitic lava dome. In trailway to a mountaintop, we can enjoy a lava transition from greish basalt to reddish-brown andecite. Students of Toyama High School in Tokyo were invited for a lecture before Super Science High School (SSH) program at Waseda Univ. 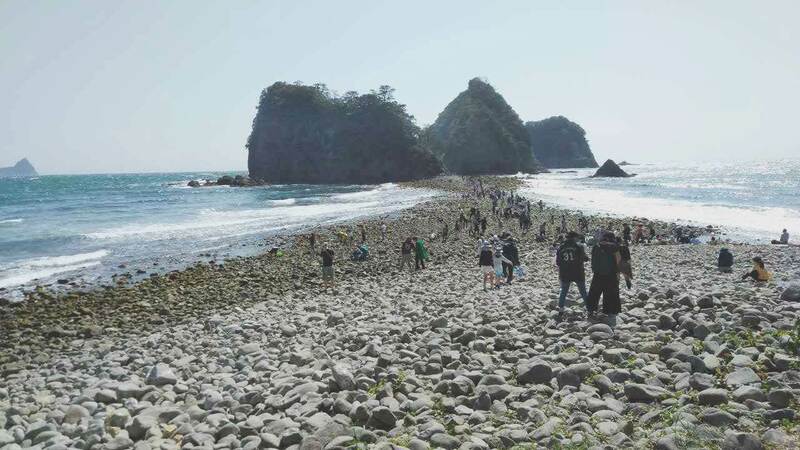 Our department has actively supported projects of SSH since 2004; fossil cleaning experience, visiting laboratories, and Jogashima field-trip. 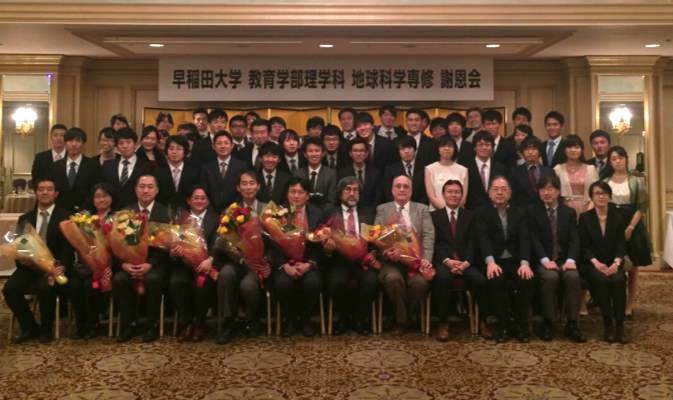 50th Anniversary Celebration of Department of Earth Sciences, Waseda Univ. at Rihga Royal Hotel Tokyo. 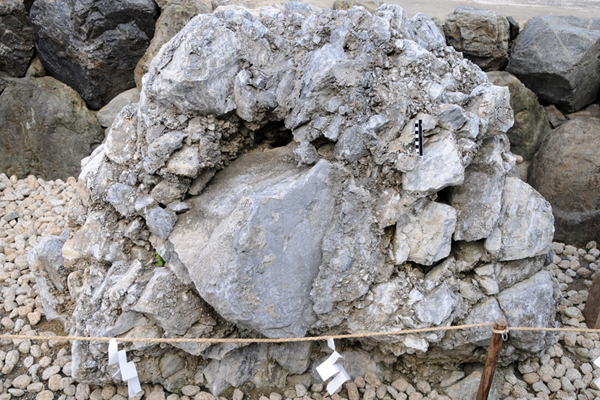 Photograph of the type section of the So key tuff bed at Arasaki area, Yokosuka City. This key bed documented at ca. 6 Ma is widely distributed into the Misaki Formation of the Miura Pennisula. 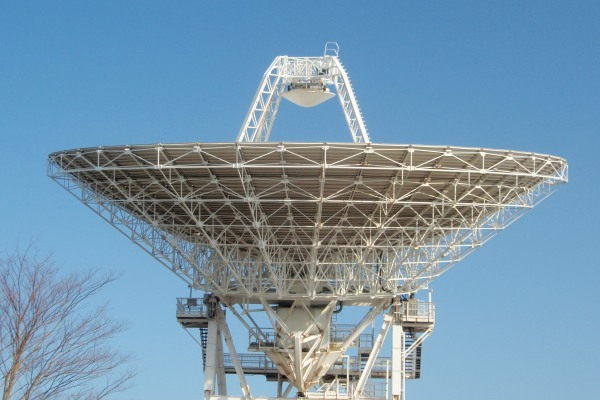 34m anntener of the Kashima space technology center, which is capable for immediate observation of radio source, operates over a frequency range from 〜50GHz to 300MHz with cooling system using liquid helium. 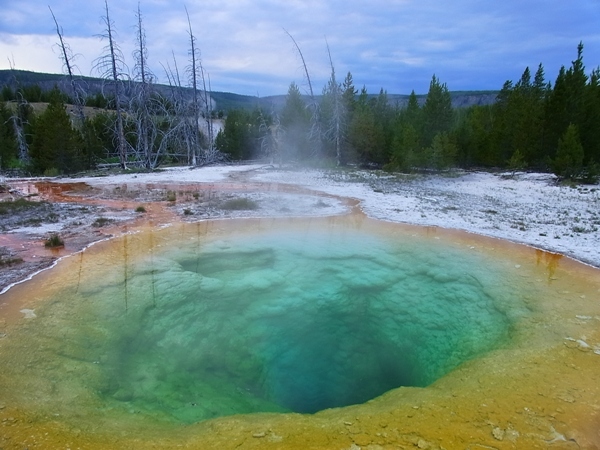 Morning Glory Pool in the Yellowstone National Park. 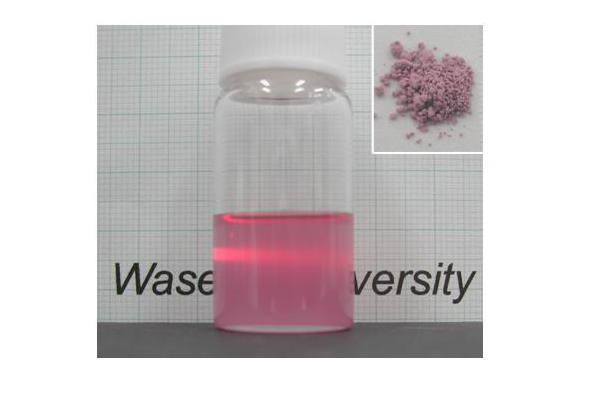 The beautiful color variation comes from thermophilic bacteria inhabiting in the hot spring an absorption of sunlight. The orange color is due to the presence of pigmented bacteria, whereas the blue color is due to refraction of sunlight, thus all colors of sunlight but blue are absorbed by the water body, and blue light is reflected back to eyes. 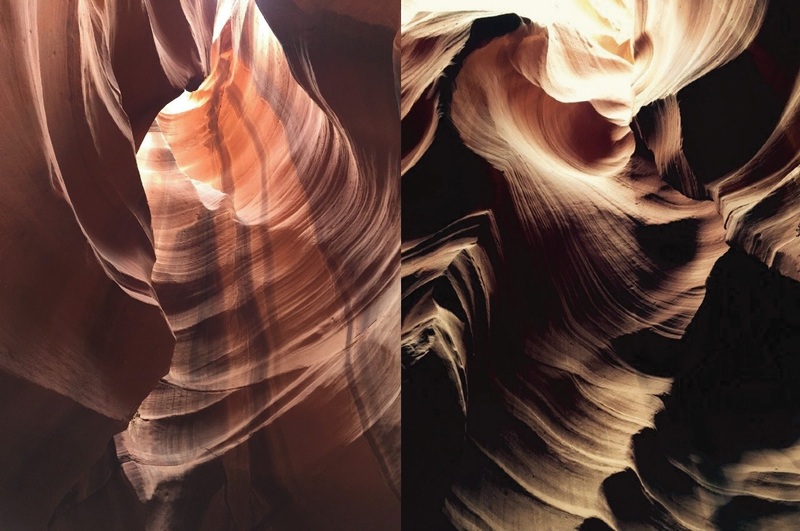 Antelope Canyon (Navajo land east of Page, Arizona) is a famous scarp, which formed by erosion of Navajo Sandstone. This beds of red sandstone are a eolian dune deposits in early Jurassic. 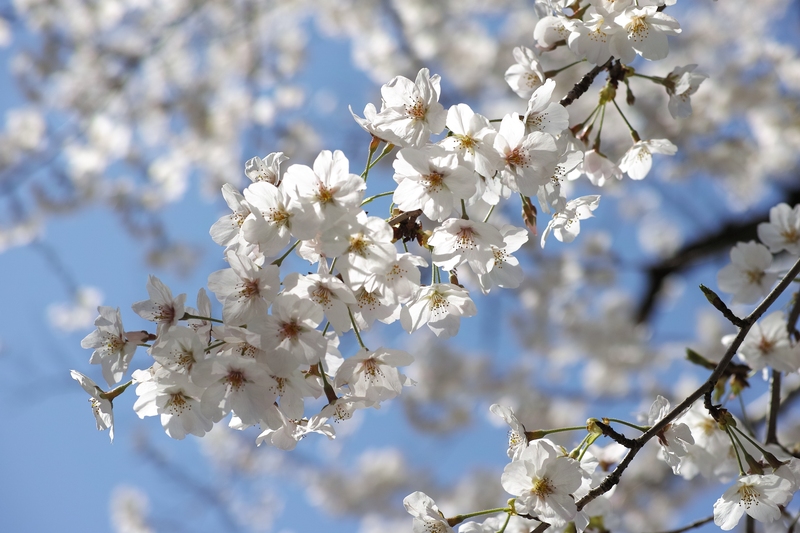 Cherry blossom along Kanda river. 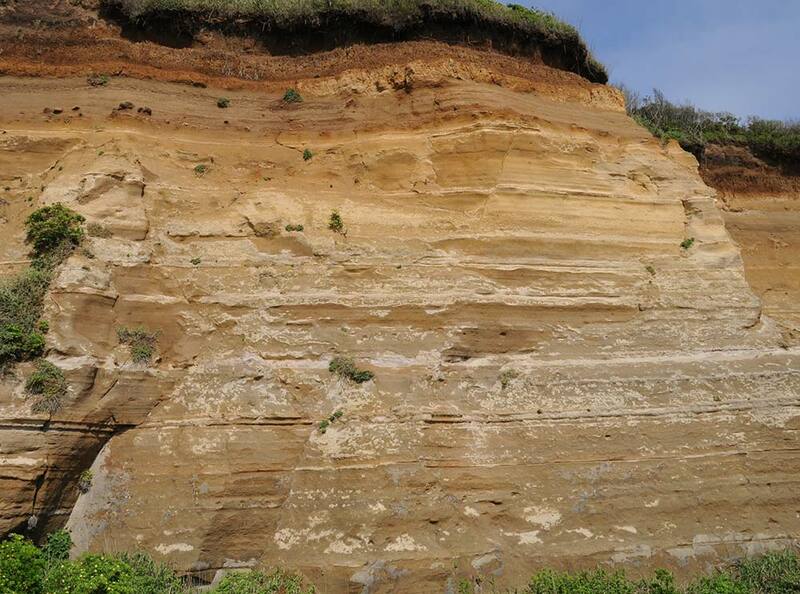 The strata including typical Neogene-Quaternary boundary at Byobugaura, Choshi Geopark. 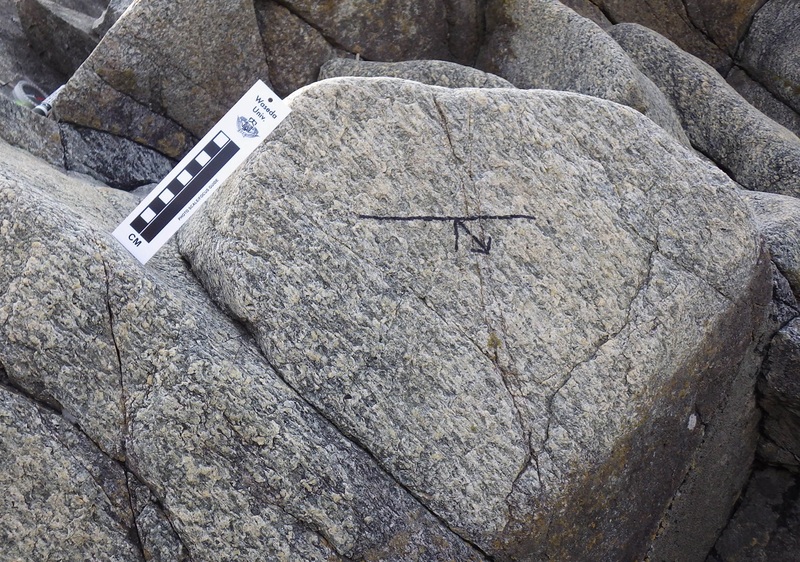 Deformed and metamorphosed hyaloclastite in the Mikabu Belt at Shimonita Geopark. 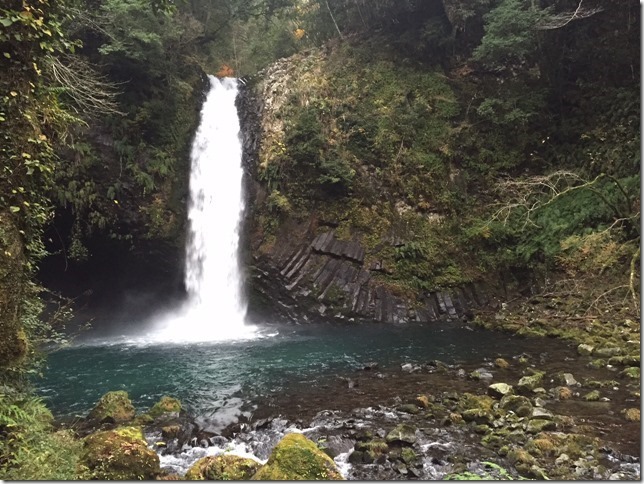 The Joren Falls and columnar joints formed by lava flow which erupted 17,000 years ago, Izu Peninsula Geopark, Shizuoka Prefecture. 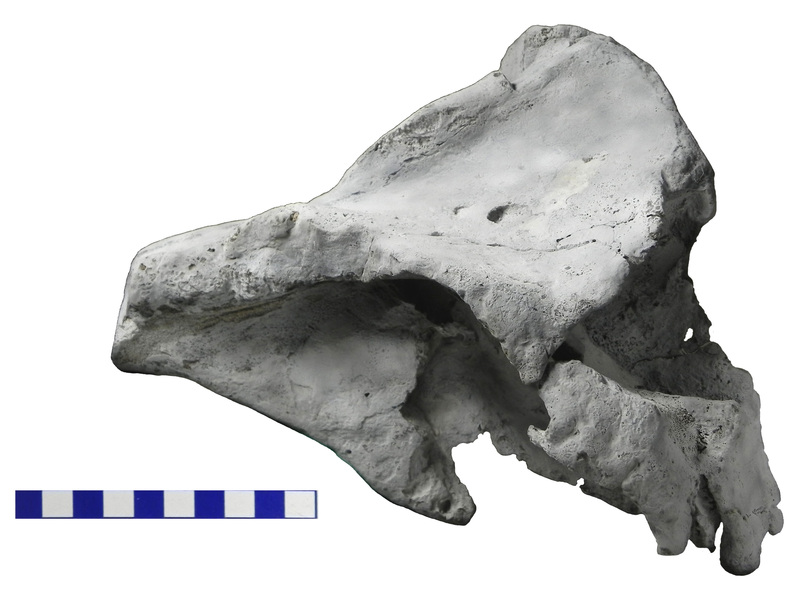 The skull of Eodelphinus kabatensis redescribed by Murakami et al., 2014. 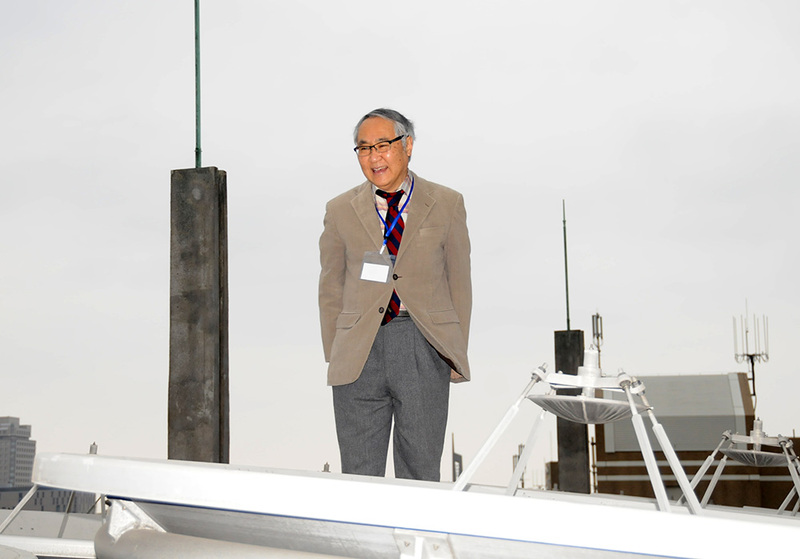 Prof. Daishido at the 64 radio telescopes on the roof of blg.15, Waseda Campus, after his final lecture. 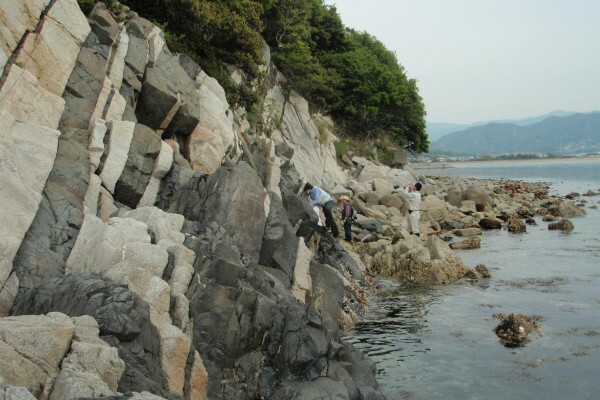 Stretching lineation of mylonite developed in the Shirakamidake granitic rocks, Aomori prefecture. 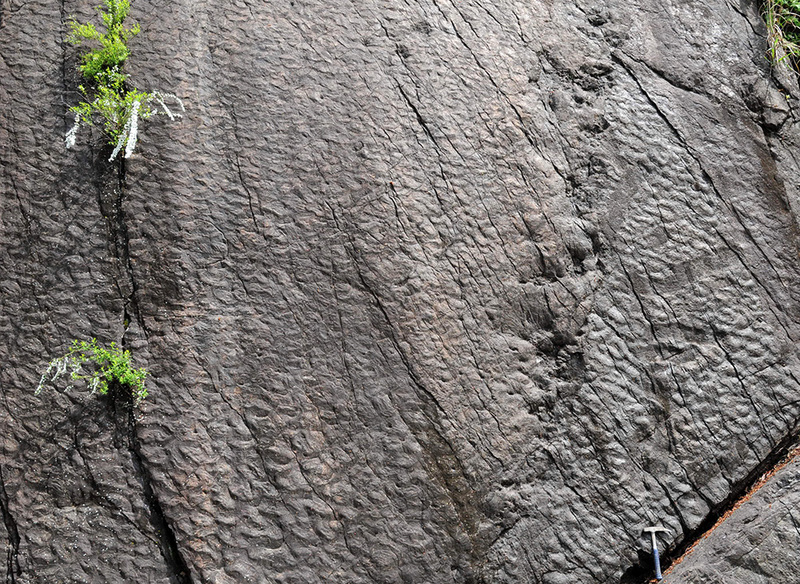 Ripple marks and dinosaur footprints at Sebayashi, Cretaceous Sanchu Group. Pseudotachylyte (white arrow) developed along the Asuke Shear Zone. 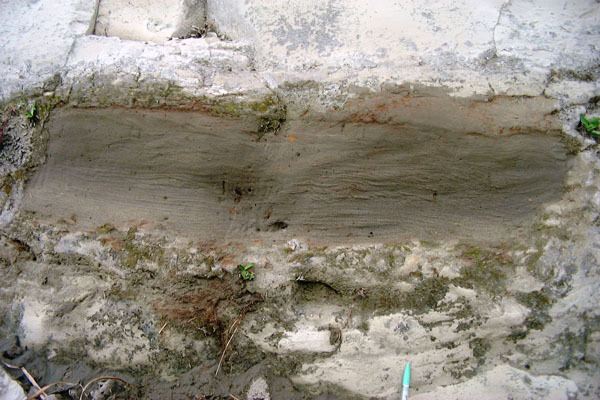 Pseudotachylyte is formed by frictional melting of faults during seismic movement. 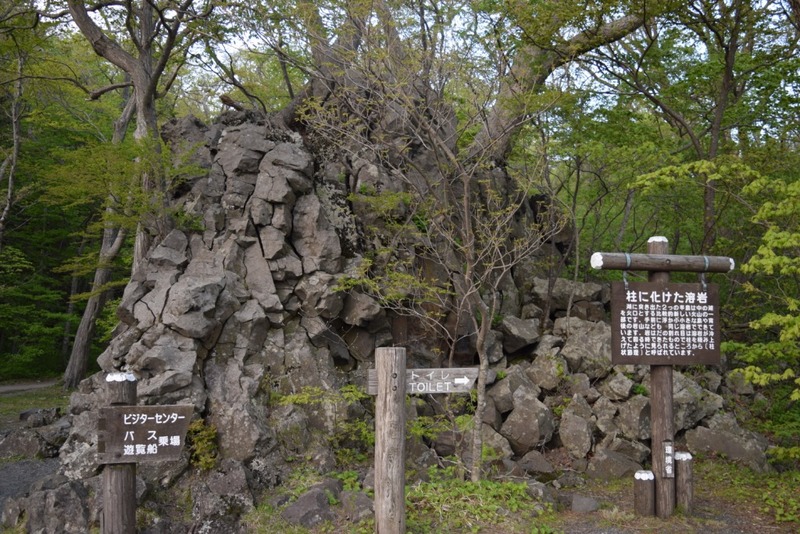 One of the 100 sites of geological structures in Japan. 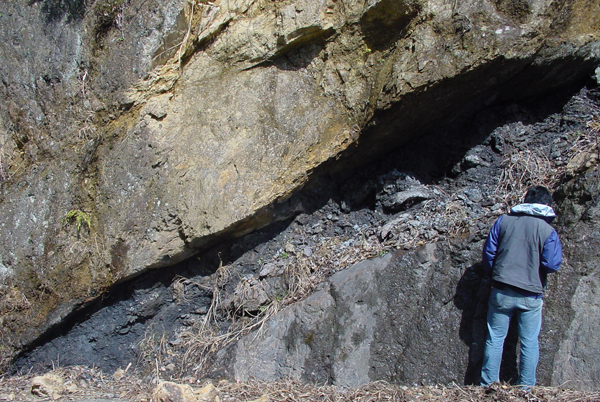 Median tectonic line (MTL) in the Mizoguchi outcrop, Nagano Prefecture. 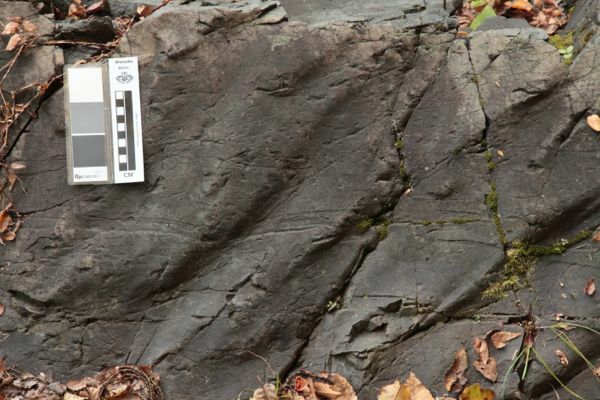 Felsite dykes injected along the MTL that divided into Ryoke belt (left side) and Sanbagawa belt (right side). Earth Material Science Laboratory participated in Open Campus 2016. 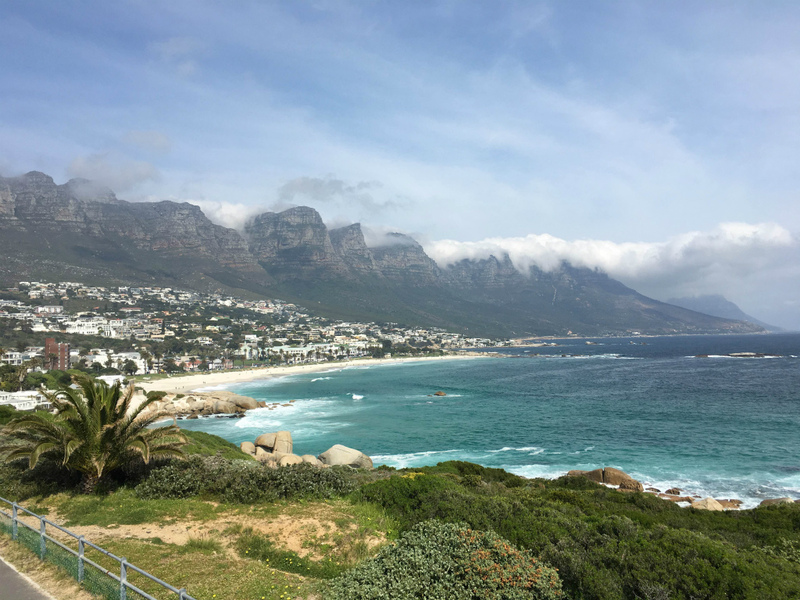 Distant view of Table Mountain, South Africa. 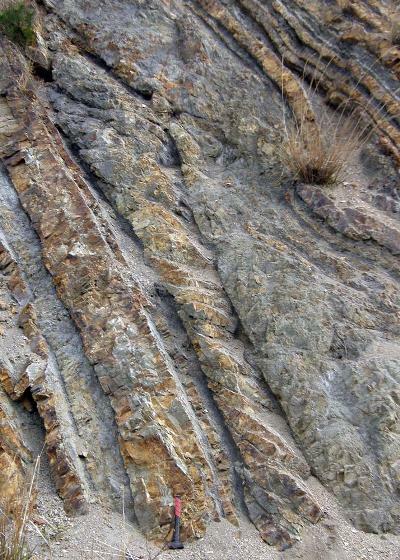 The Table Mountain Sandstone made up predominantly of quartzitic sandstone laid down 510-400 Ma form horizontal strata. 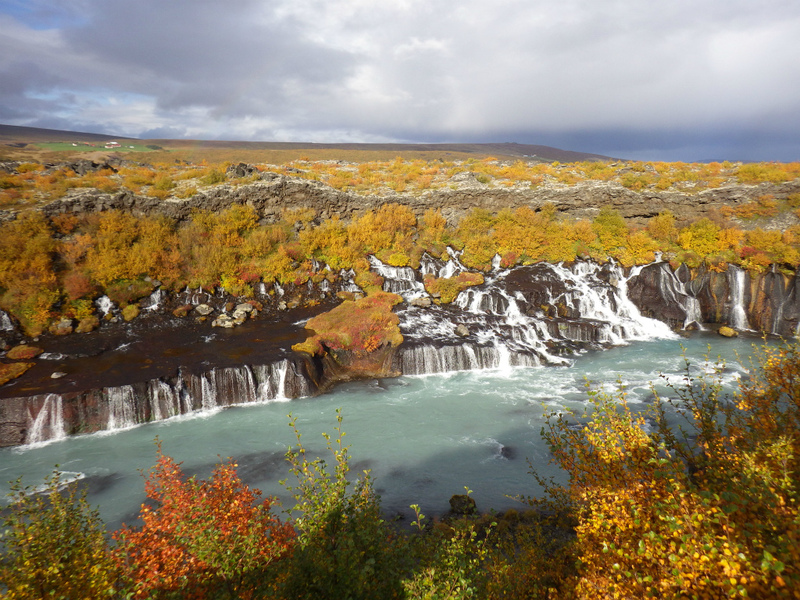 Hraunfossar (meaning "lava falls") is a series of springs coming out of the Hallmundarhraun lava flow appearing like a long 900m strand of cascades laced within the rough grooves of the lava. 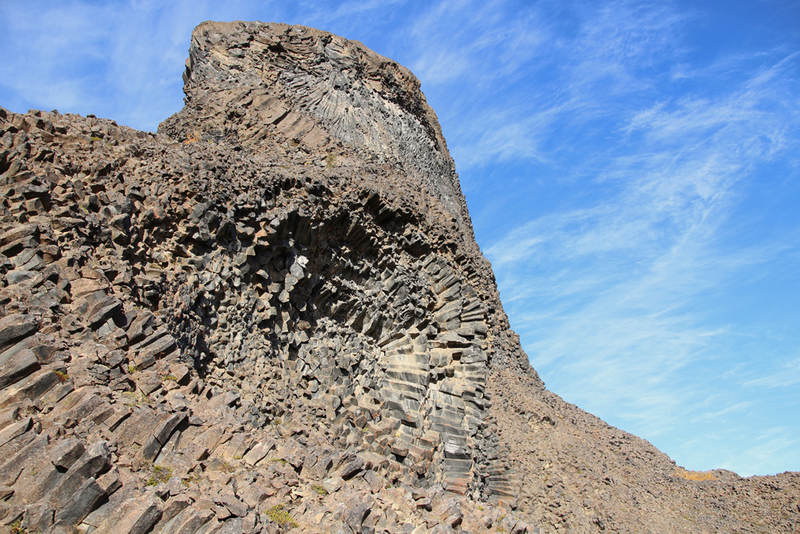 Columnar basalt forming “lava roses” at Hljodaklettar, Iceland. 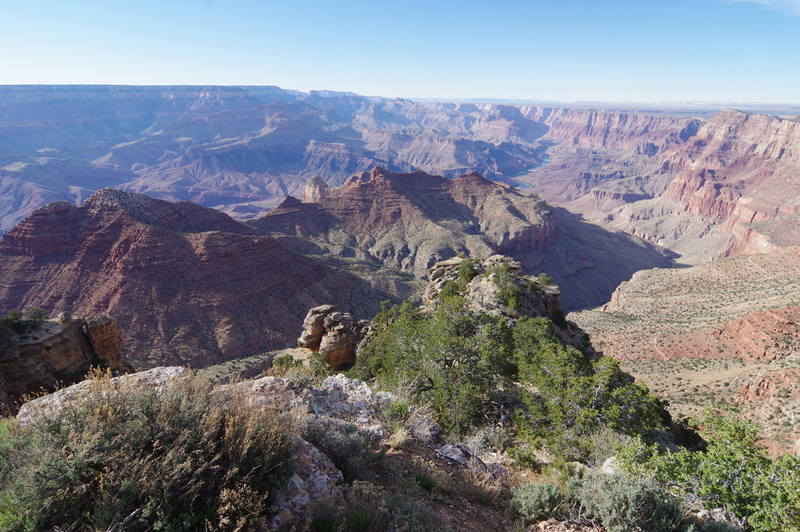 River morphology of the Colorado River in the Grand Canyon. 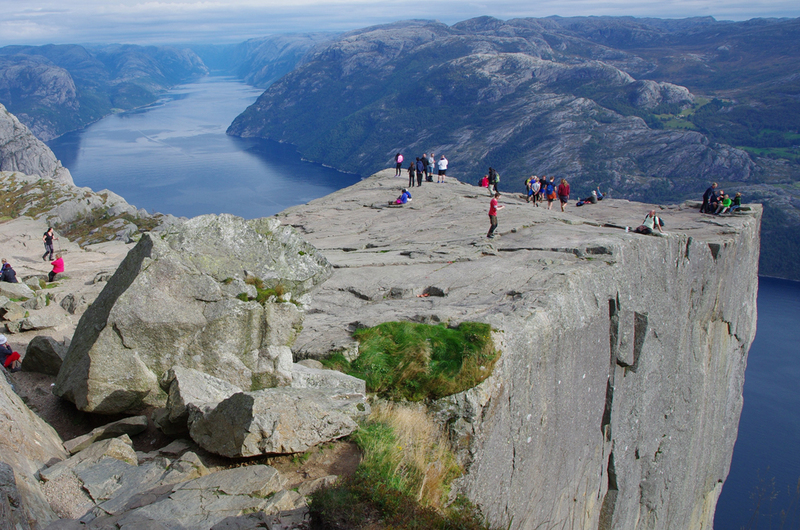 Steep clif known as the Preikestolen that hangs about 600m in the Lysefjord, Norway. Quartz crystals grown in druse in granite. 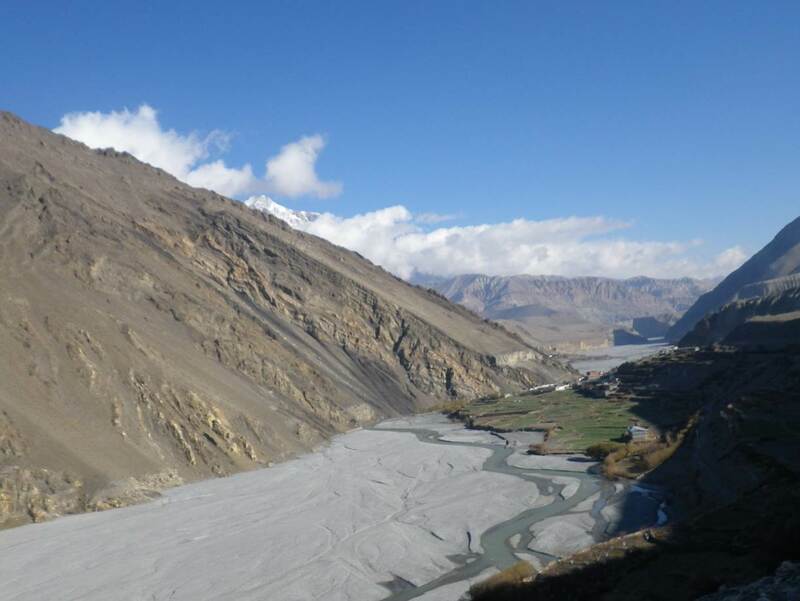 Braided river in Kali Gandaki River, Nepal. 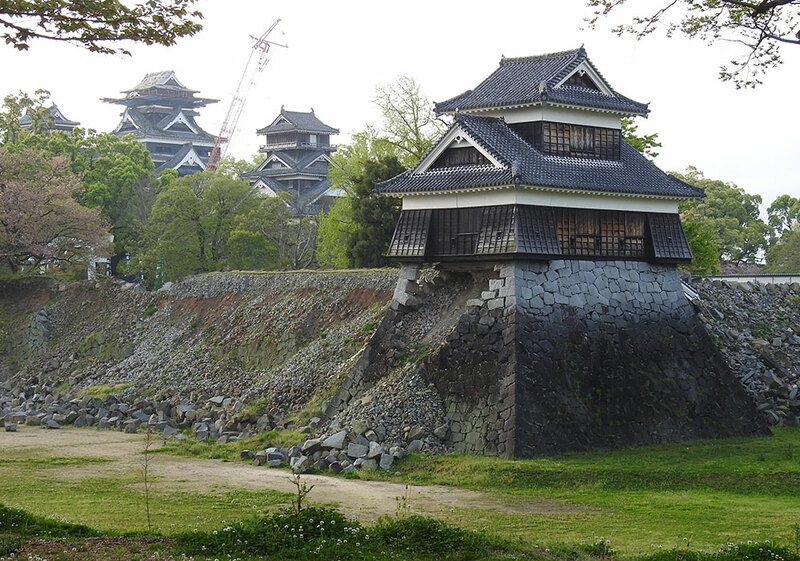 Kumamoto Castle passed for 1 year from the 2016 Kumamoto earthquakes. 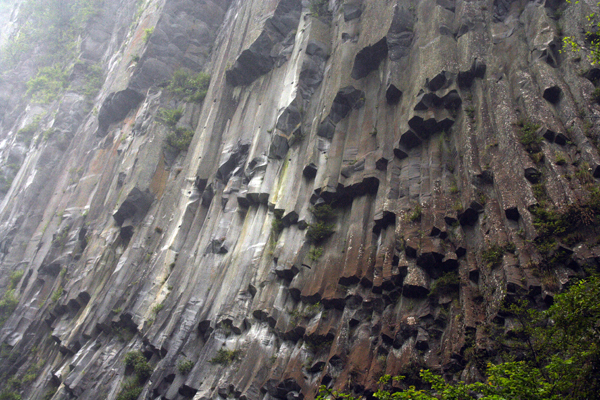 Columner joints observed around Lake Towada in Aomori. 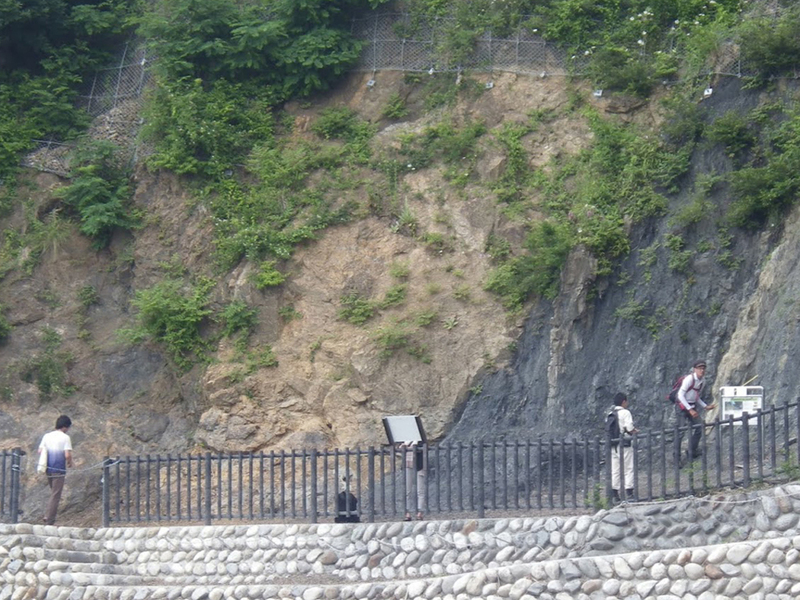 Bedded chert in Inuyama, Pref. Aichi. Nishiyama crater route in Toya caldera and Usu volcano UNESCO Global Geopark, Hokkaido 2017. 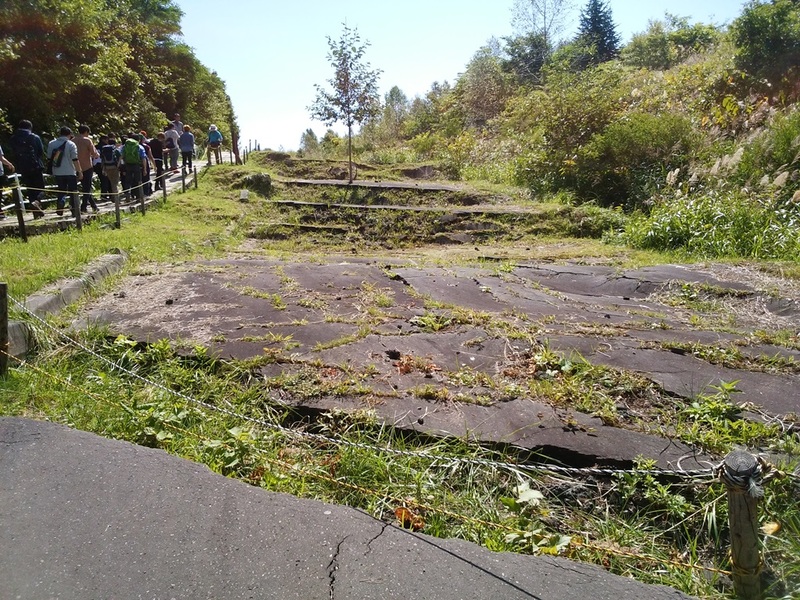 Former flat pavement is lifted up to 70m after an eruption in 2000. 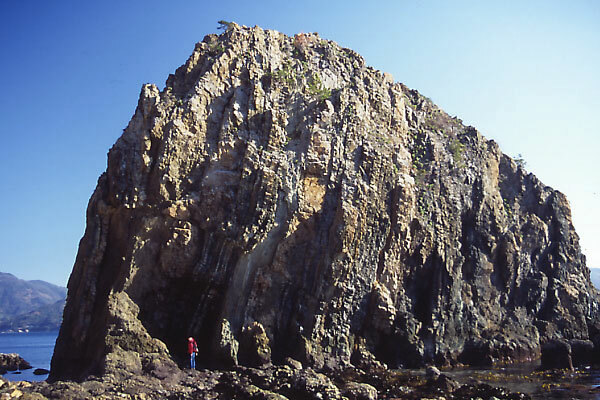 Siluro-Devonian volcaniclastic rocks called "mammoth-rocks" found in Susaki coast, Ehime Prefecture. 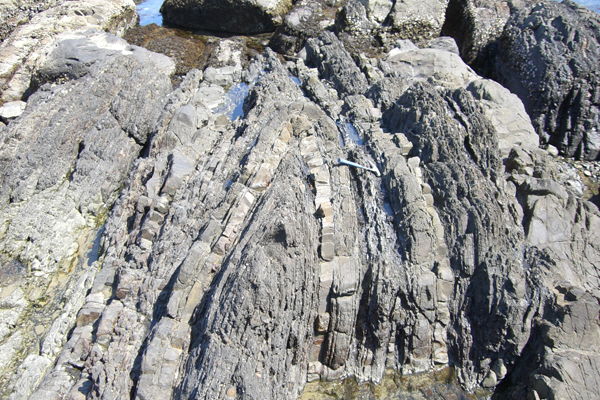 Slump structure seen in Misaki Formation, Jogashima. 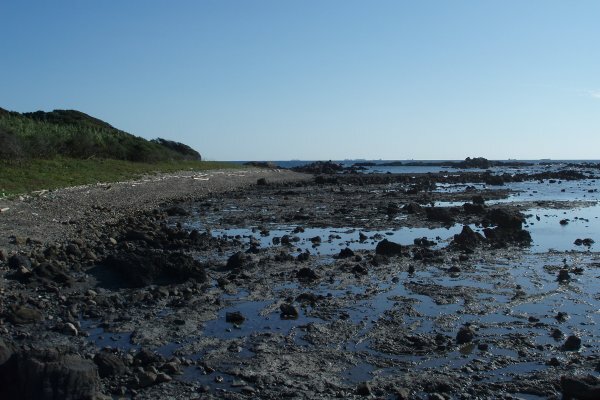 Lava fields on the south of Sakurajima, Kagoshima. Tiger Leaping Gorge in the uppermost part of Yangtze River, China. 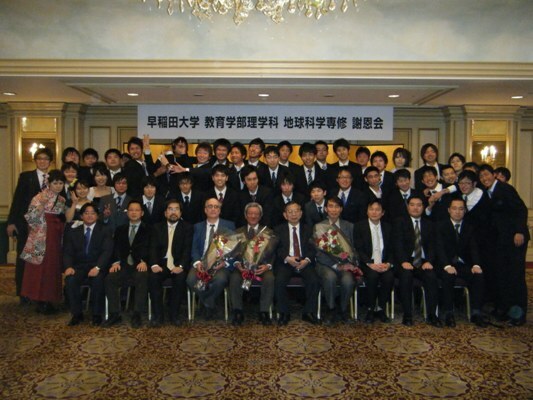 The party given by the new graduates in honor of the teachers. Mt. Showashinzan in Hokkaido is smoking even now. 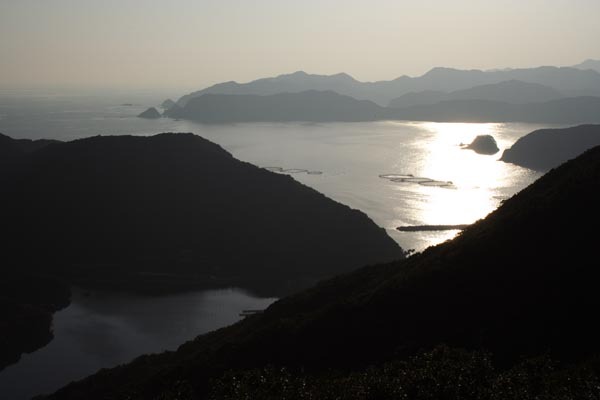 Sanshirojima-Islands in the south part of Izu Peninsula. 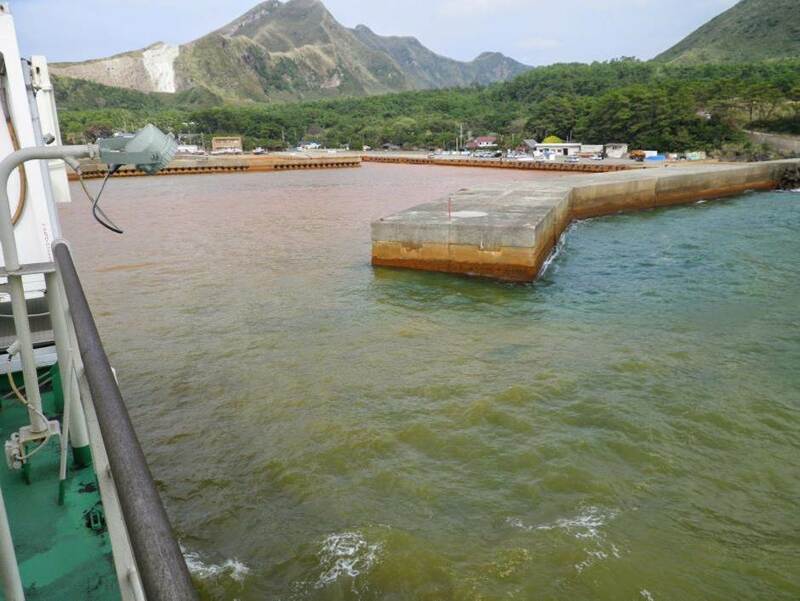 Varved sediment in Lake Suigetsu, Fukui Prefecture. A snowy gorge preserved in the crater of Mt. 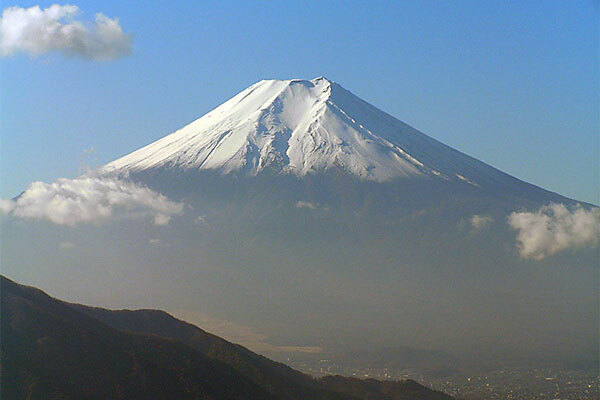 Fuji and Kengamine, the highest point in Japan. 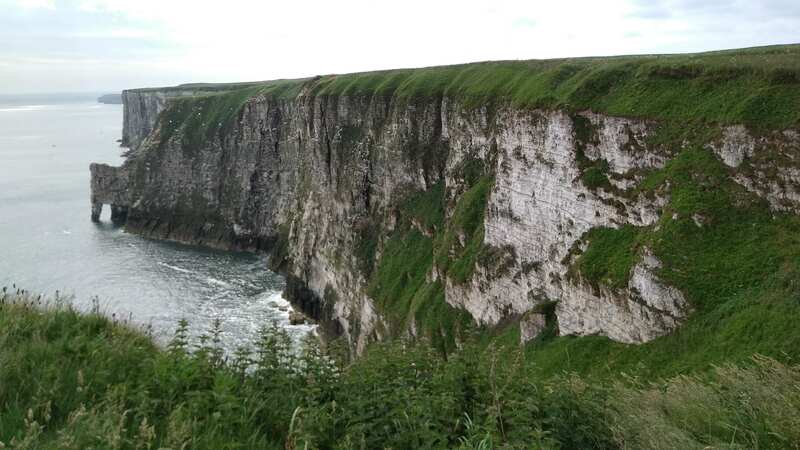 Bempton Cliffs in North Yorkshire, England. Satsuma-Ioujima Island in Pref. Kagoshima. 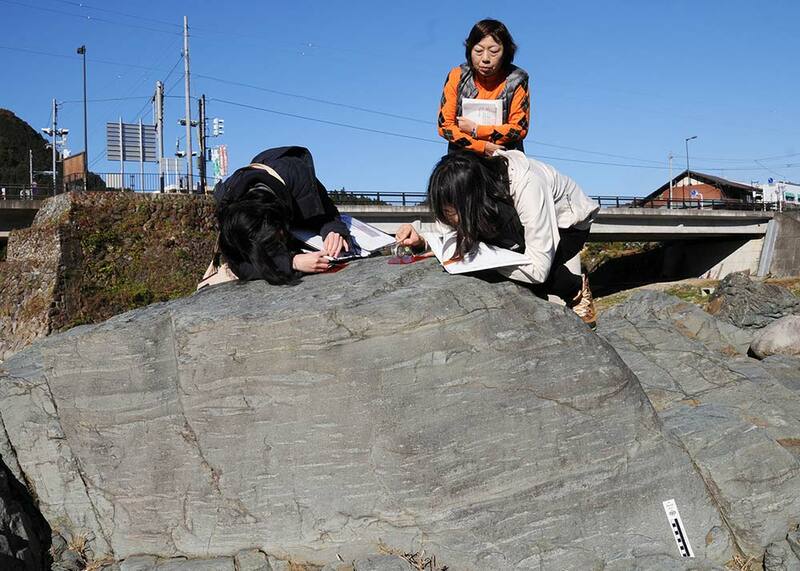 Prof. Takagi giving a lecture on Quartz schist in Hakucho-jima Island, Nagatoro. 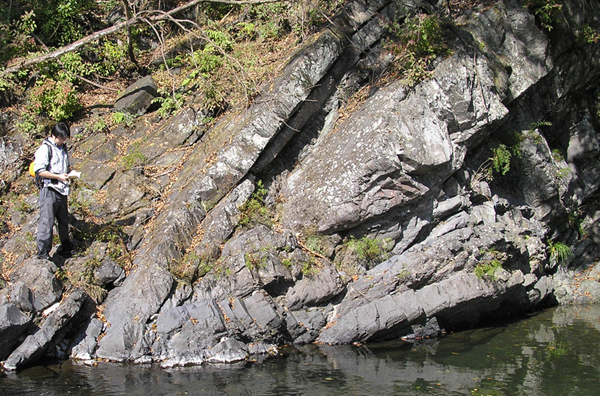 Synformal anticline in the Atogura Nappe, Shimonita Geopark. Copyright（c）2003-2017 早稲田大学教育学部理学科地球科学専修　All rights reserved.